Starting this year (2016) Japan instituted a new national holiday called Mountain Day which will be held every August 11th. So what does Mountain Day have to do with bicycles you may ask? By far the most famous of all mountains in Japan is Mt Fuji. 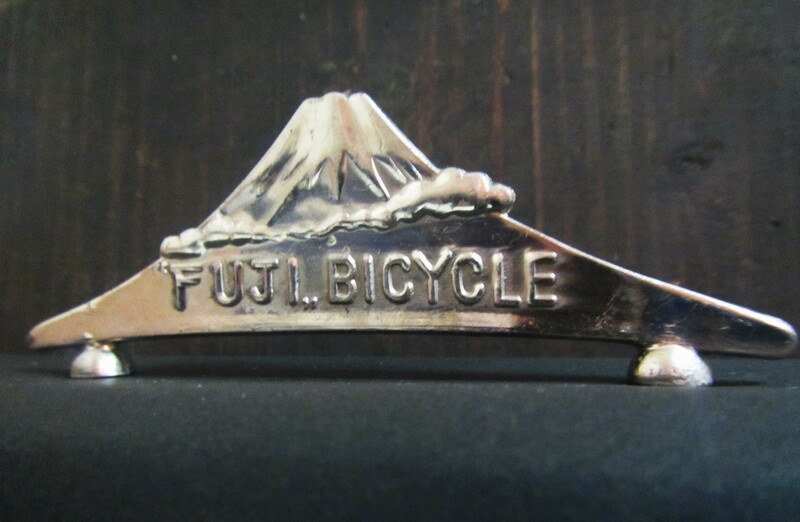 Mt Fuji is not only a symbol of Japan but the trademark of one of Japan’s most famous bicycle manufacturers, Nichbei Fuji. 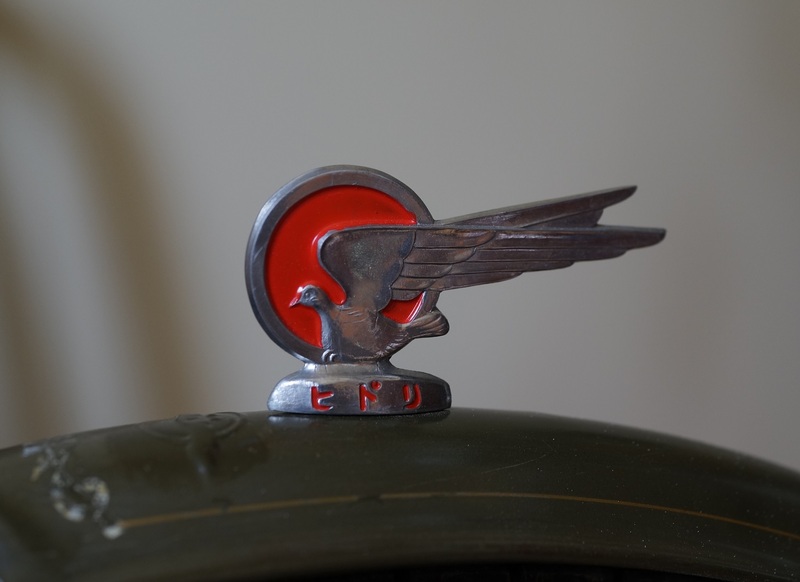 The company was known to go to great lengths to design-in their trademark into parts. Examples can be seen in the four post Fuji Feather Series (Post 1, 2, 3, 4). 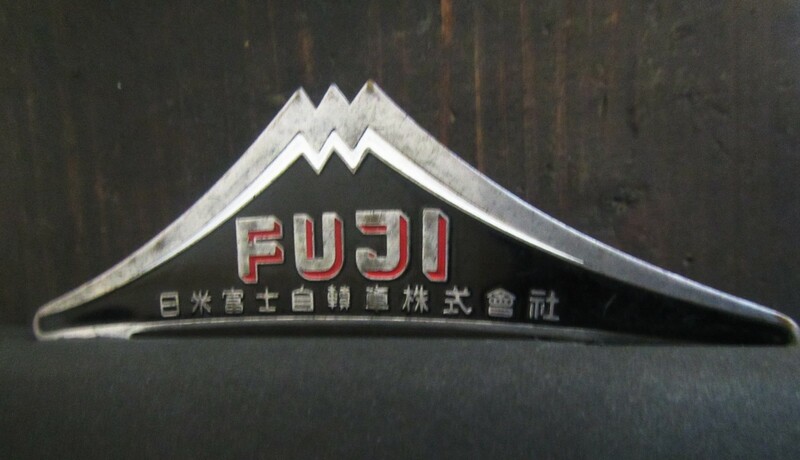 To commemorate Japan’s first Mountain Day let’s take a look at one of the most well-known parts that Nichibei Fuji designed and produced in the fashion of Mt Fuji, the infamous Nichbei Fuji fender ornament. 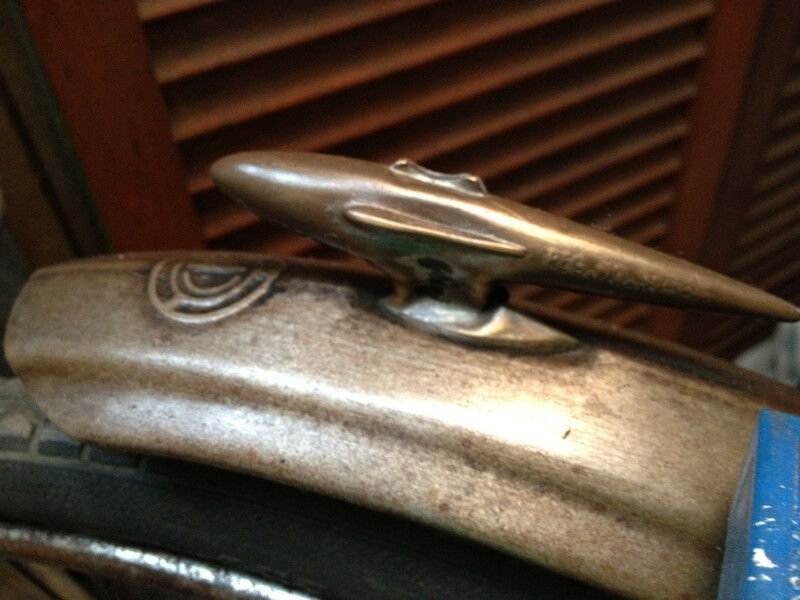 Fender ornaments roughly came in two styles the figure (Japanese link only) and plate type (Japanese link only) . 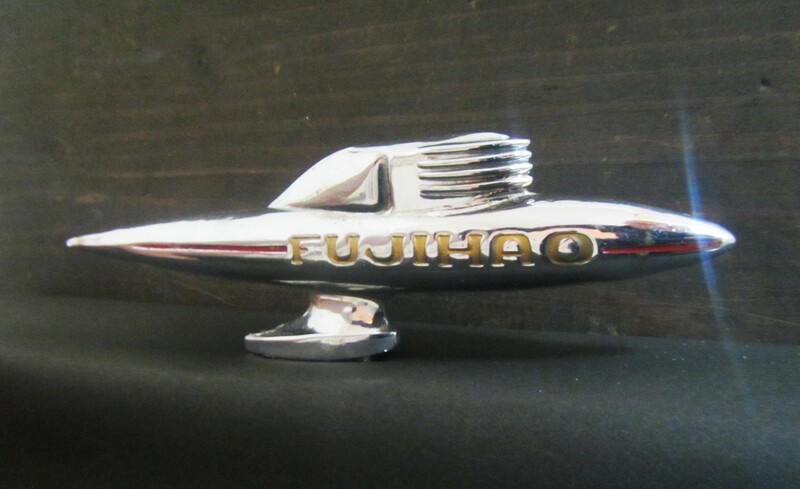 The Mt Fuji shaped Nichibei Fuji fender ornaments may be considered a combination of the two since it was predominantly a plate type but shaped in the form of Mt Fuji. 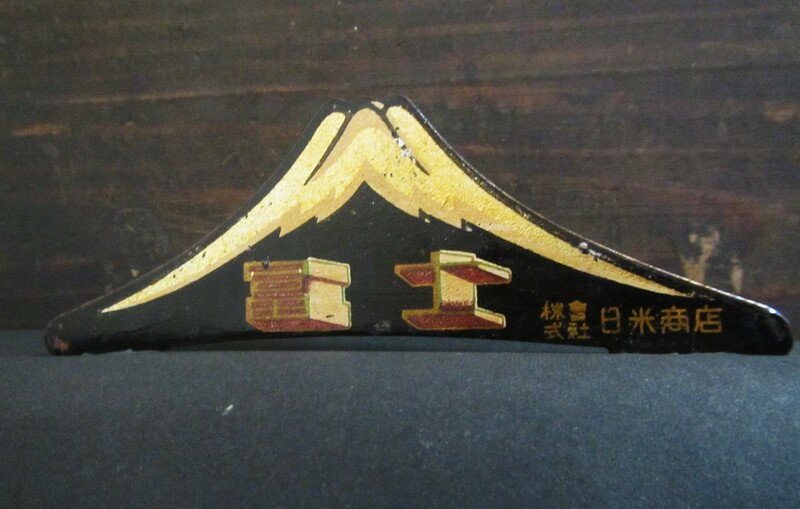 Very old and rare hand painted version of the Nichibei Fuji fender ornament. Casted all chrome version complete with low hanging clouds. This must have been on a high-end model as it is nearly 3mm thick and quite heavy. 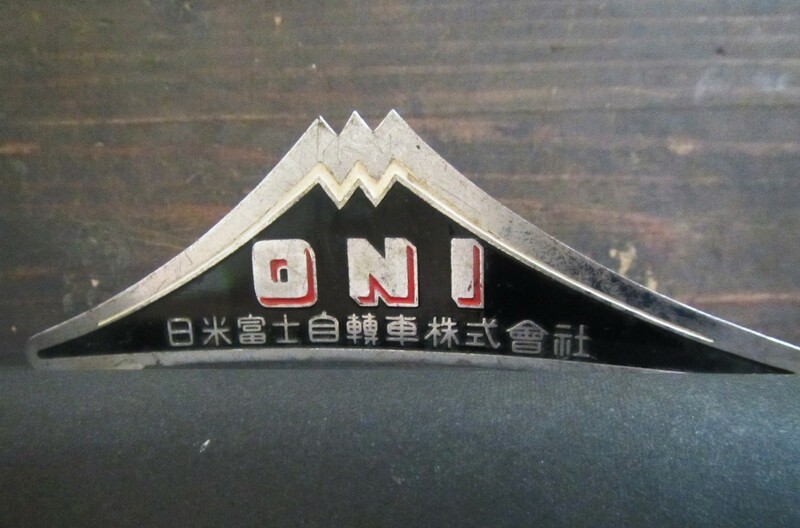 The most common version of the moutain shaped Nichibei Fuji fender ornament. 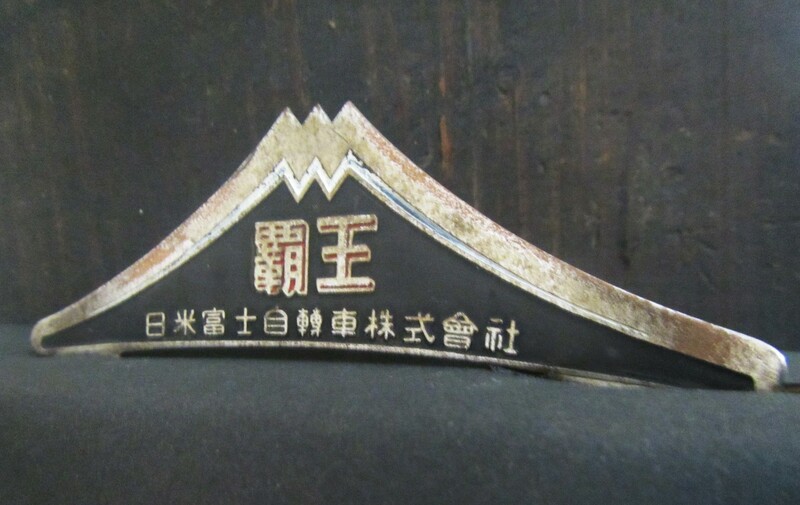 Nichibei Fuji also used model names as in this case the "Hao" (Supreme ruler or King of kings) Nichibei Fuji's top of the line model. 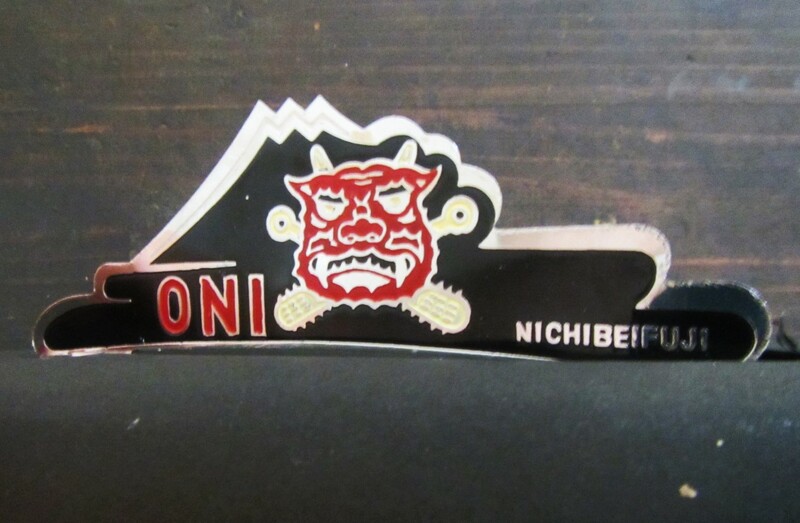 A later version of the Oni. 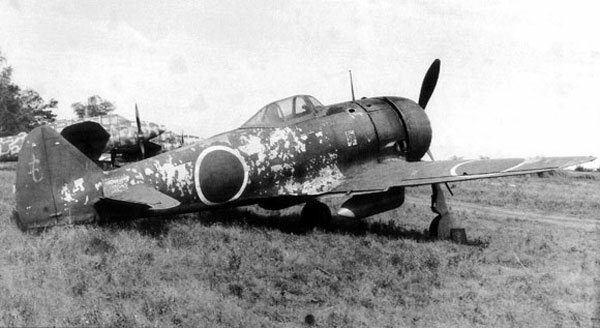 Although the mountain shaped fender ornament was without a doubt the most prevalent style, Nichbei did occasionally use a different style as shown below which was found on some later Hao models. In Mountain Day & Nichibei Fuji (Part 2) we will take a look at another interesting part that Nichibei Fuji designed in the Mt Fuji trademark . 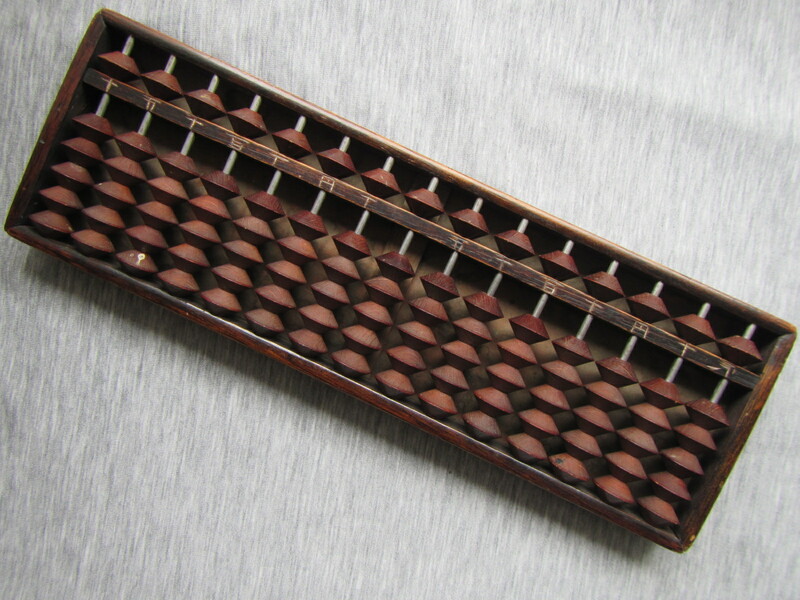 Here is an old Japanese abacus Part #1 (abacus Part #2). I have fond memories of the abacus, or soroban in Japanese. When I first came to Japan for a brief stay back in the early 1980's I often visited an old mom & pop store and the proprietor would calculate the purchase using the abacus and then turn the abacus so that it was facing me to show me the total. Of course I had no idea how to read the abacus, let alone what the proprietor was saying as I spoke no Japanese at the time. 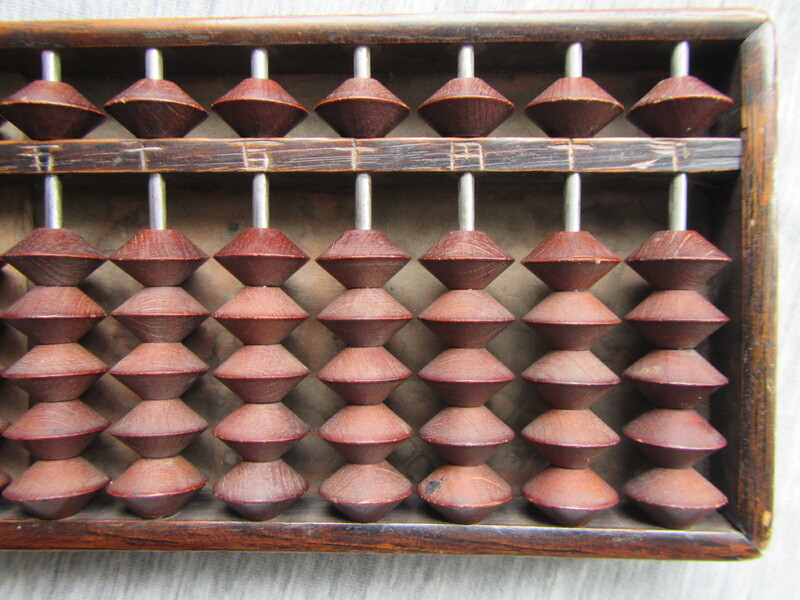 So what does this abacus have to do with vintage Japanese bicycles? 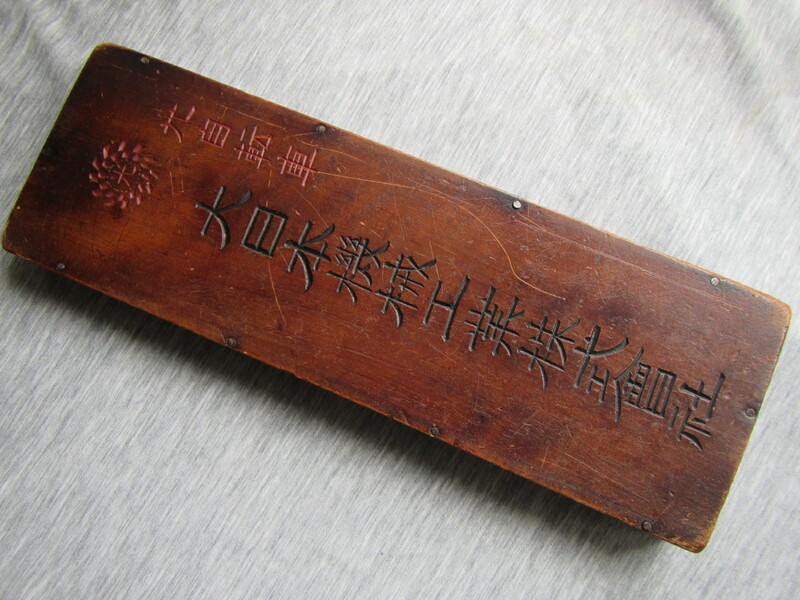 On the back of the abacus is the infamous Hikari Dai Nippon Kikai Kogyo. 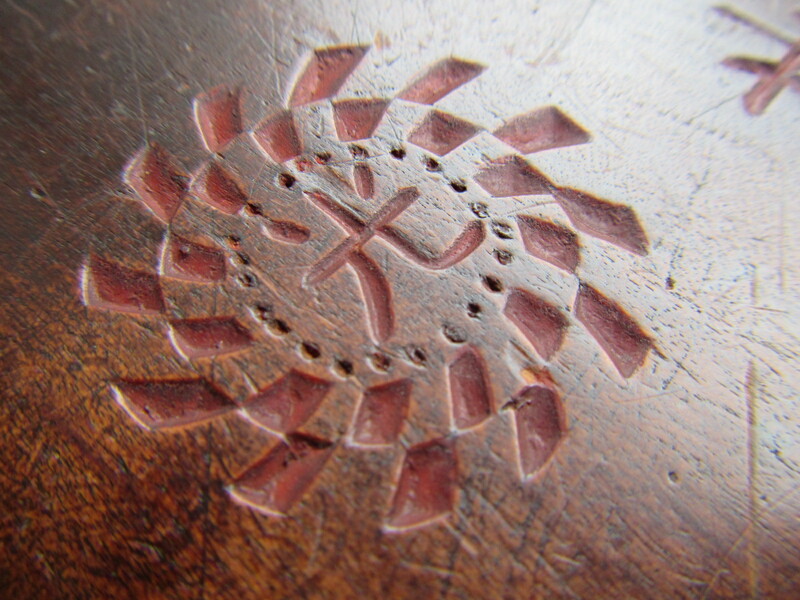 The following is exquisitely hand-carved 光自転車　大日本機械工業株式會社" （Hikari Jitensha, Dai Nippon Kikai Kogyo Kabushiki Gaisha). 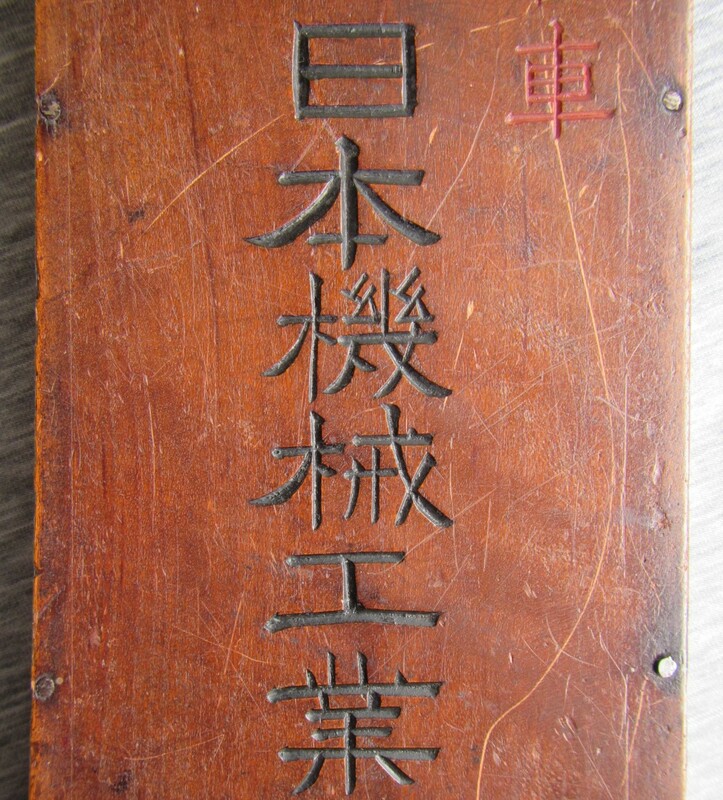 Any loyal fan of this blog will know that I have a great admiration for the Chinese characters or Kanji. To write these is an art all to itself, but to hand-carve these is another art altogether. The bead pattern in this abacus is the older type one upper, five lower as opposed to today's version one upper, four lower. 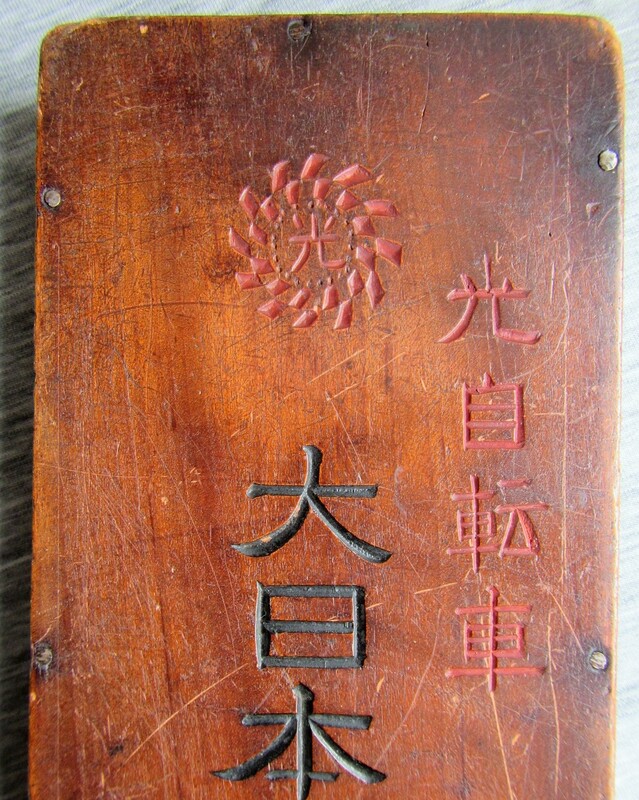 Thus, this abacus dates back to around the 1940's. Craftsmen made these nearly all by hand (video) with each individual bead one-by-one hand finished. In today's fast paced, mass-produced, disposable society, I cannot help but feel that the abundance of cheap disposable goods has created a mindset whereby people no longer take care of things, feel a need to make them last, or, reuse things. Sad but true. 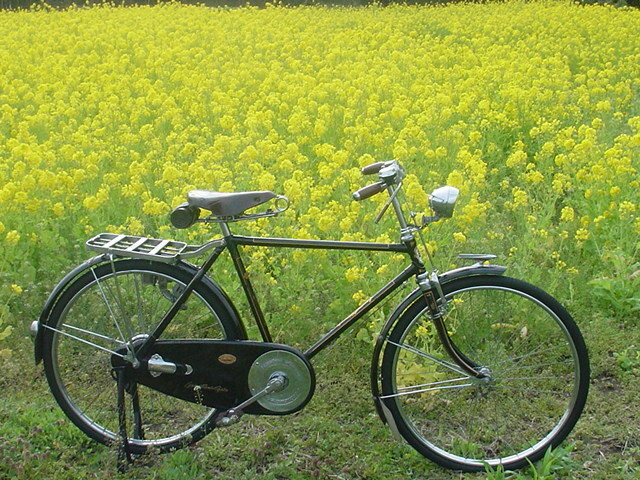 Here is a real beauty sent in by M-san, a Hidori from the 1950's. Several years back we had the pleasure of looking at a similar Hidori (Japanese only). Let's take a look at M-san's Hidori. 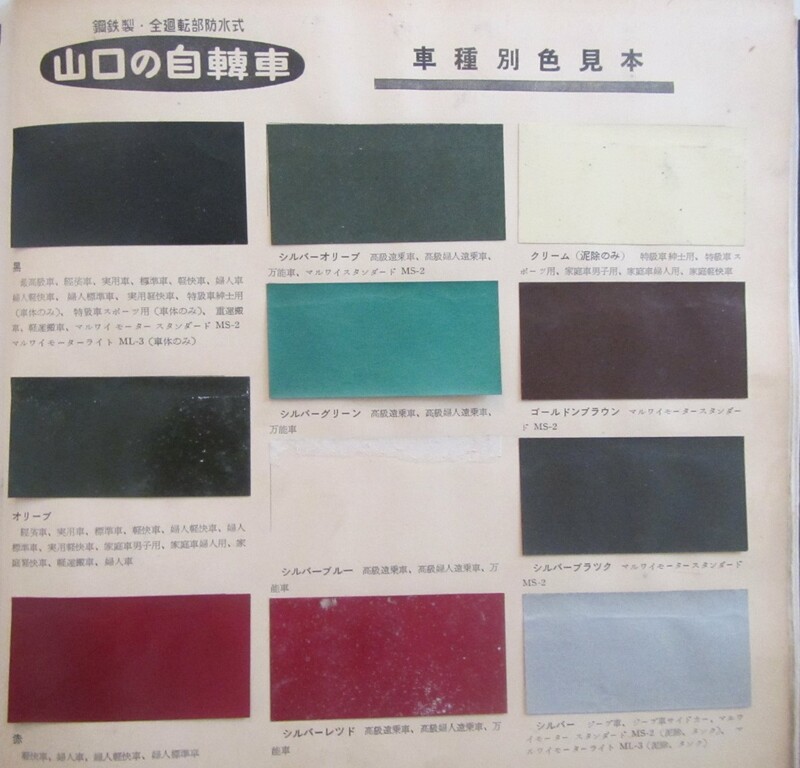 Although black was by far the predominant color of utility and carrier bicycles in the 1950's, there were other colors as can be seen in the color chart taken from a mid-1950's Yamaguchi bicycle catalog. After black was certainly olive green. Olive green seemed to be favored by the Hidori. 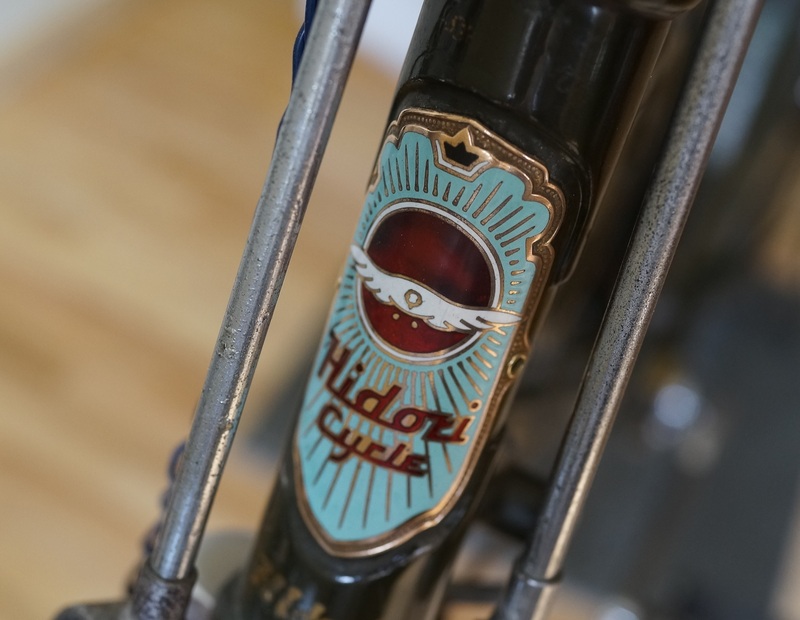 Another distinct feature of Hidori bicycles is the round plate brazed to the frame between the top tube and down tube as shown in the photo below. "Black and gold" are a great combination, but olive green and gold also go great together. The symbol of Hidori is a breed of duck known in English as Euroasian wigeon. 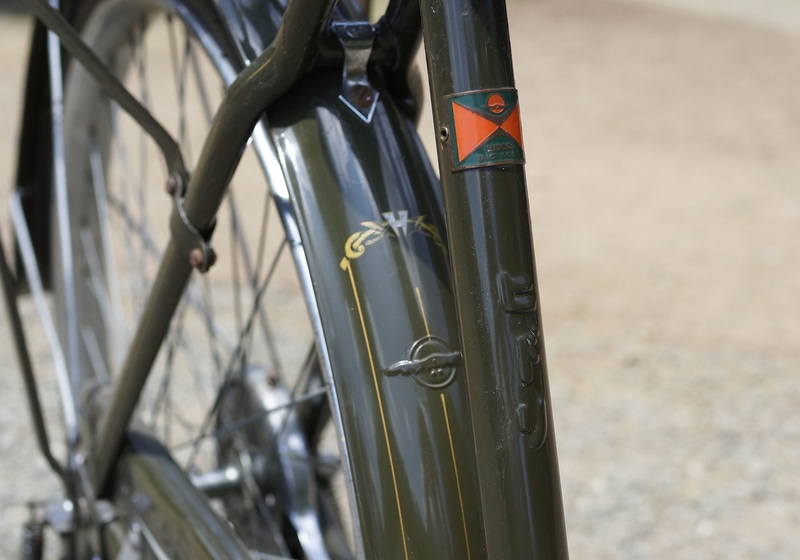 As is typical of Japanese bicycles from the 1950's the company logo and name can be found on nearly every part. If you a re going to put your name on it, it had better be good. Note the fender ornament (Japanese only) below. 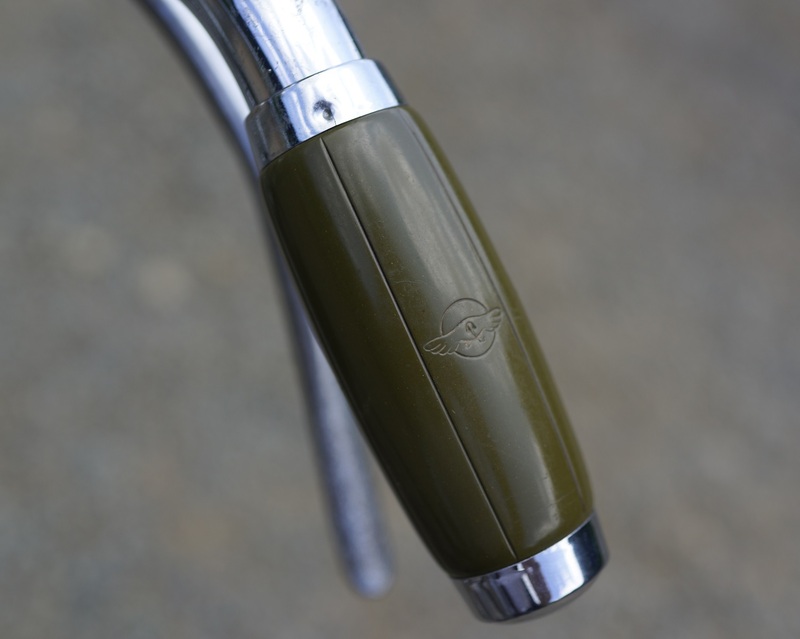 A nice cloisonne badge embedded in the handlebars. 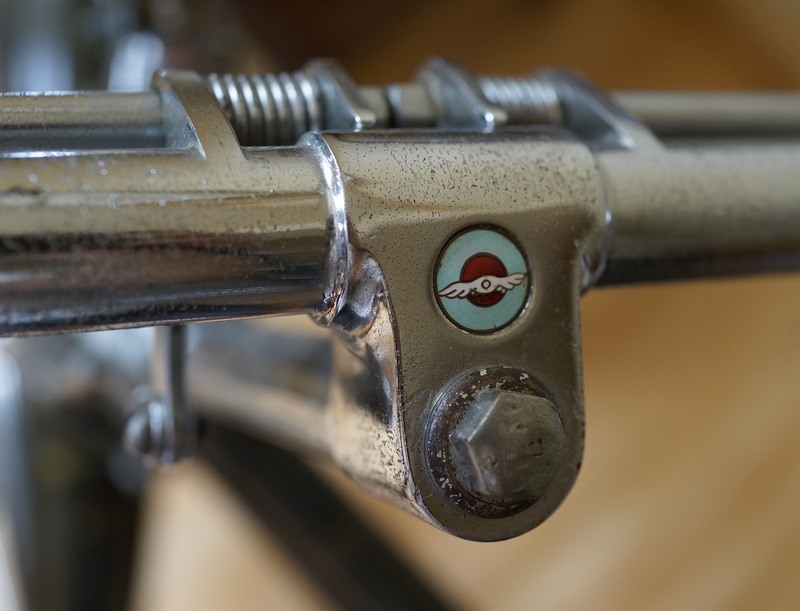 Chrome is in nice shape considering the handlebars were manufactured over half a century ago. They don't make them like they used to (Part 1). 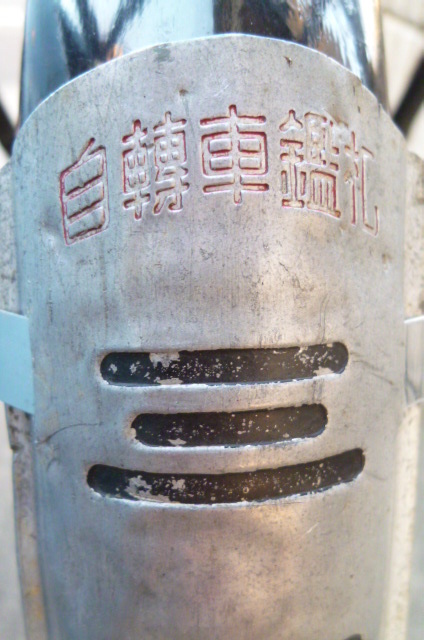 Hidori logo on the lamp bracket. 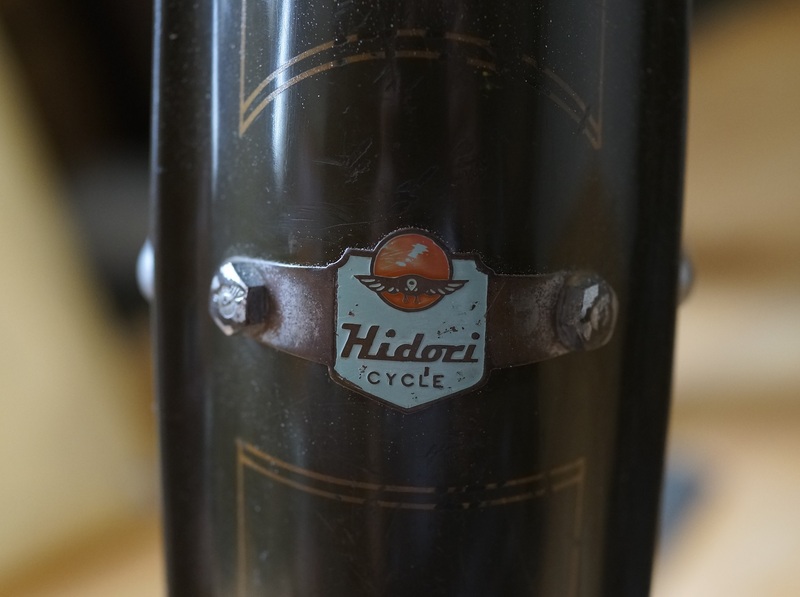 Hidori logo on the olive celluloid grips. one would never know the difference. 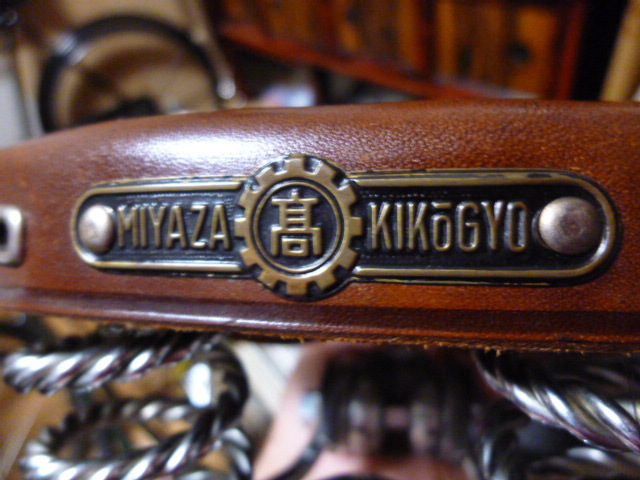 Note the Hidori badge on the rear of the leather hamock saddle, and, name stamped on the rear carrier. Look closely and you will see that not only does the logo appear on the fender stay badge but the heads of the tiny fender stay bolts (Japanese only) also has the logo casted-in. 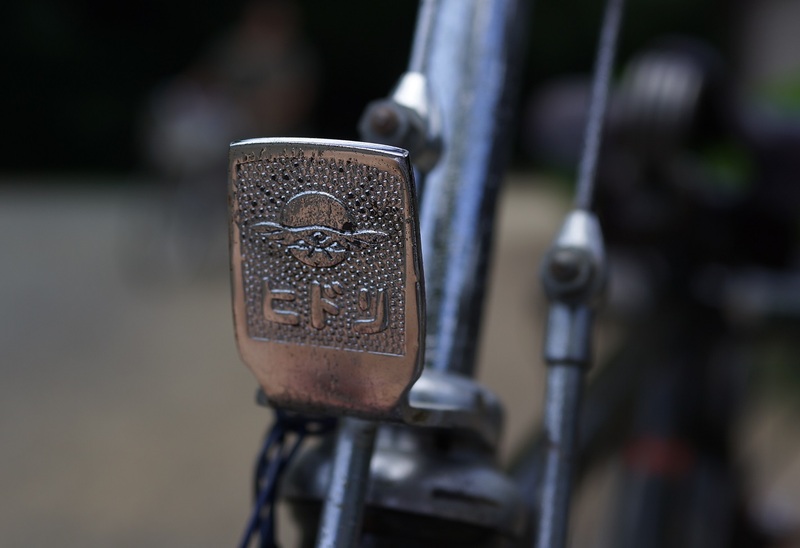 Cottered bottom bracket and Hidori logo on the cotter pin covers (Japanese only). 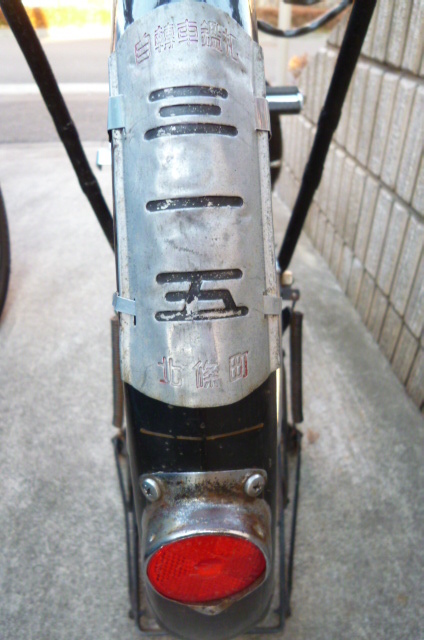 Hidori logo on the rear brake, fender stay and stand. No, they "Don't make them like they used to (Part 2)". Today Japan is widely recognized for making superior quality automobiles, motorcycles, home appliances, etc. But after WWII one of the first things Japan turned to was bicycles. 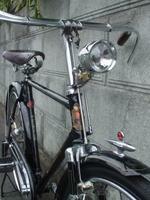 And up until Japan became an automobile society around 1960's, most households depended on the family bicycle. In the 70th Anniversary of the End of WWII (Part 1) it was mentioned that Japan's bicycle industry began a long decline starting in 1932 as it moved from free enterprise system to state controlled enterprise system and this lasted up until the end of WWII in 1945.
and, Nakajima Aircraft Company, manufacturer of some of Japan's finest planes including the dreaded Ki-44 Shoki (Devil Queller) to diversify. In the case of Nakajima Aircraft Company, it was broken up, resulting in the birth of Fuji Heavy Industries (present day Subaru automobiles). 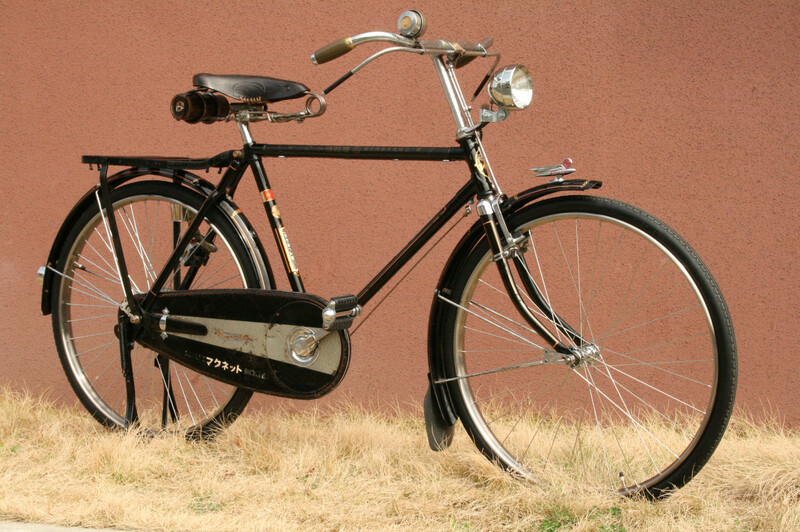 In the case of Mitsubishi Heavy Industries, a former attack bomber design engineer came up with the unique idea of utilizing airplane strut material (duralumin) as the material for a streamlined bicycle frame, the Jujigo. 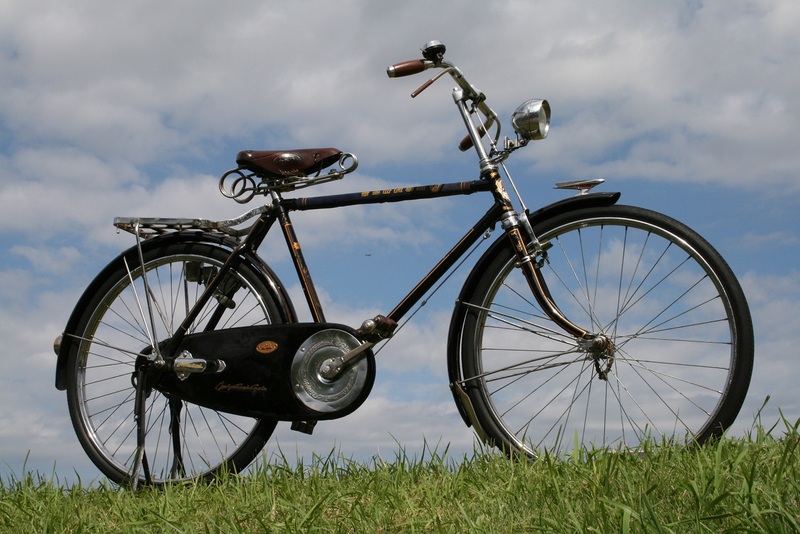 Thus, in numerous cases, highly skilled aeronautical engineers and their workforce went from designing and manufacturing aircrafts to manufacturing bicycles. What is important to note here is the influx of companies into the bicycle industry. 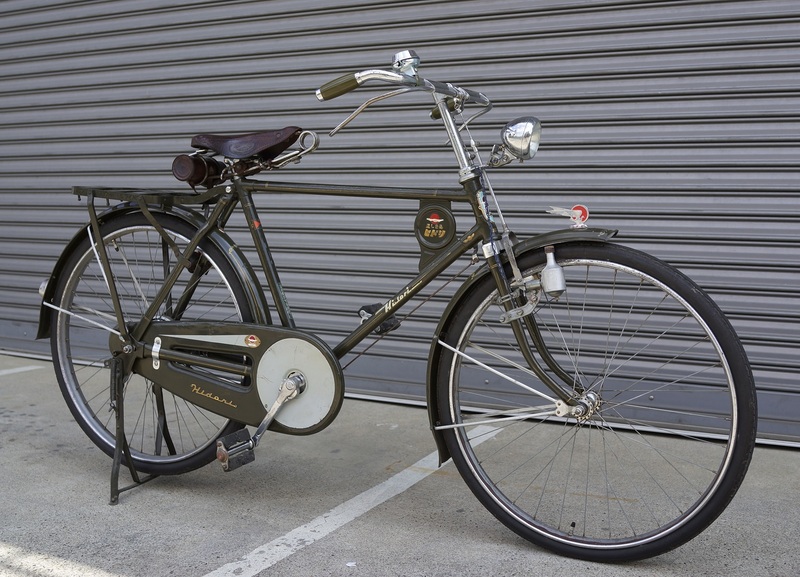 Not only were the plants themselves converted but the engineers and skilled labor force that had formerly been producing munitions were now focusing on bicycles. 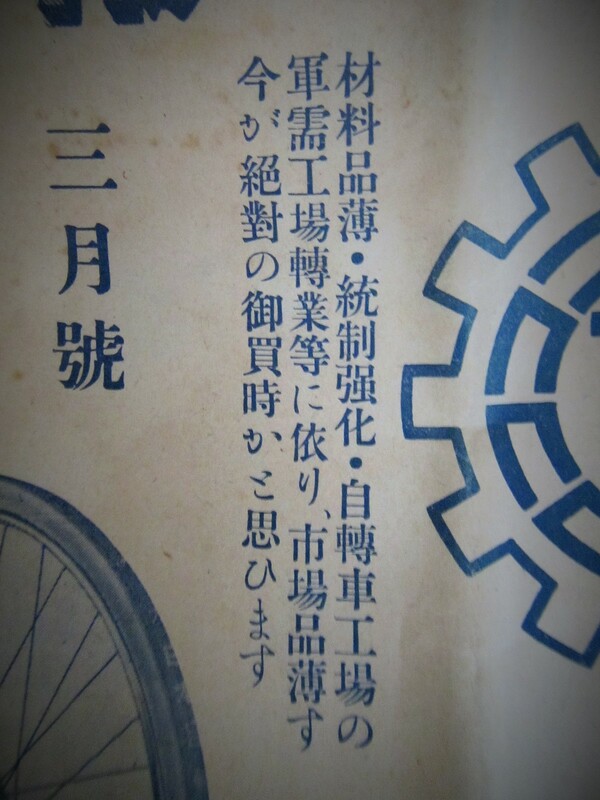 This placed great pressure on traditional finished bicycle manufacturers which were producing before, during and after the war such as Miyata Seisakusho, Okamoto Bicycle Company and others. 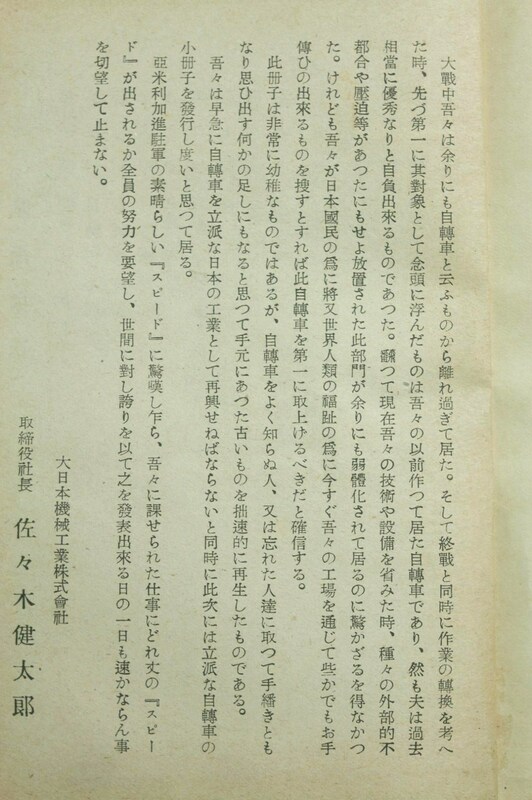 Here is a pamphlet produced in January 1946, less than six months after the end of the war. 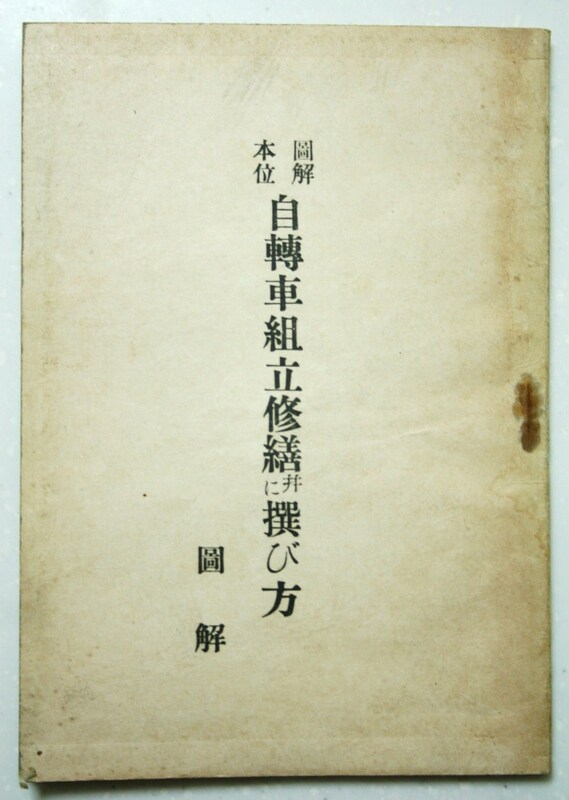 The pamphlet is entitled, "An Illustrated Guide to Assembly, Repair and Bicycle Selection", with a forward by Kentaro Sasaki, President of Dai Nippon Kikai Kogyo. "During the war we allowed ourselves to fall away from bicycles. 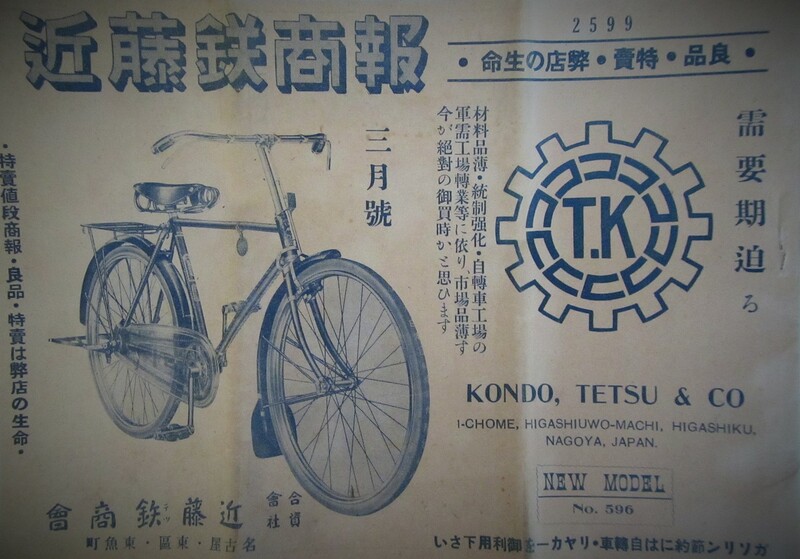 Now, accompanying the end of the war as we consider our change from munitions manufacturing to peacetime production, the first thing that spings to mind is bicycles as Japan used to be quite superior, and took great pride in bicycle manufacturing. Moreover, if we consider our current level of technology and tooling one cannot help but be shocked at the state of disrepair that this industry has fallen into due to various external circumstances and pressures. However, I firmly believe that, if we were to search for a single industry that Japan can readily turn to through the use of its factories for both the sake of our citizens as well as the sake of citizens the world over, first and foremost is bicycle manufacturing. This crude pamphlet is a reproduction based on old materials hastily assembled from whatever was closest at hand and is intended to serve as an introduction for those new to bicycles and as a reminder for old hands. 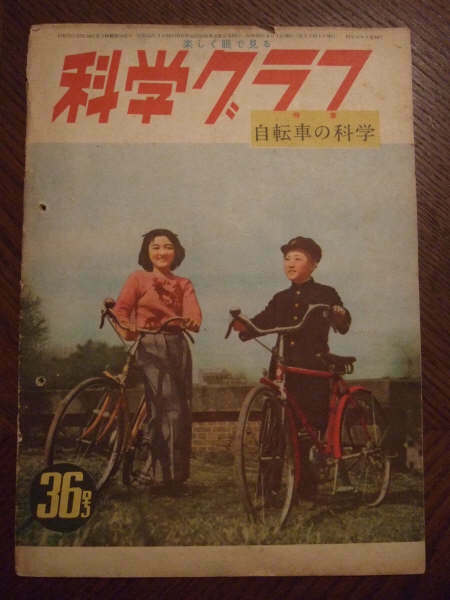 We must quickly revive the bicycle and make bicycle manufacturing a great Japanese industry, and next time around publish an improved bicycle handbook. While admiring the amazing "speed" of the American Occupational Forces, I request the cooperation of everyone to see how "quickly" Japan can accomplish the jobs ahead in reviving the bicycle industry and eagerly anticipate the day in which we can stand tall and proud and announce that Japan has achieved a great bicycle industry. Today Japan is recognized the world over for world-class high quality automobiles, motorcycles, scooters, home electronic appliances, etc. 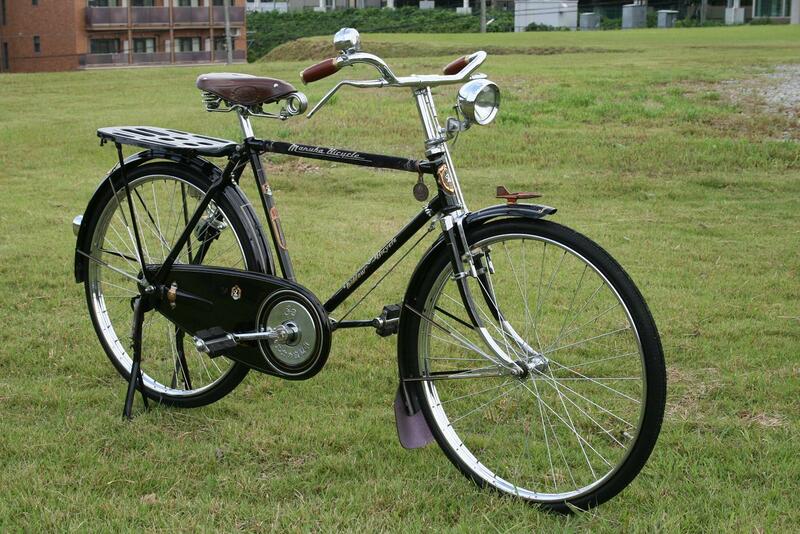 But 70 years ago, Japan was in ruins and one of the first things it turned to manufacturing was bicycles. Bicycles which were literally art on wheels. 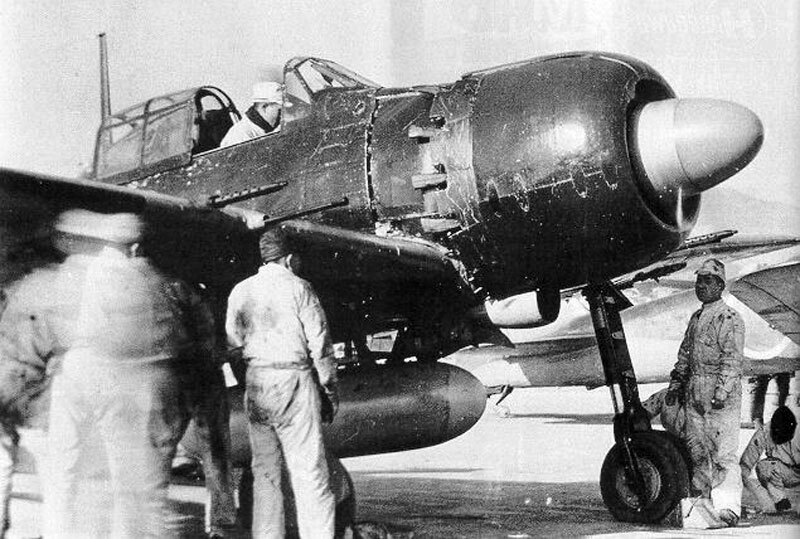 The world marks the 70th anniversary of the end of WWII this year. 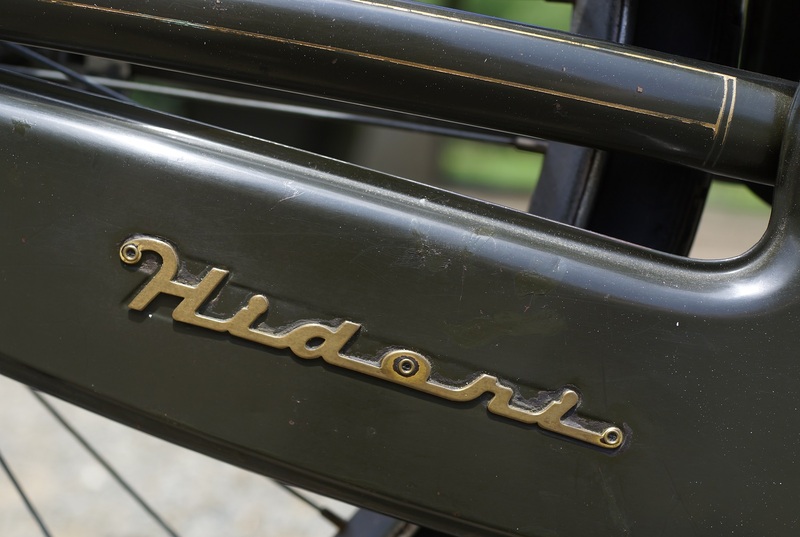 The war had a huge impact on the Japanese bicycle industry. 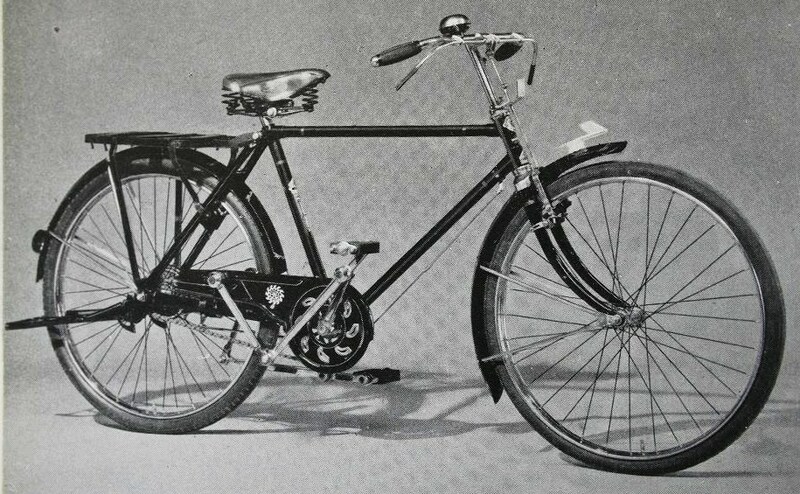 The long slow spiral decline of the Japanese bicycle industry started just after Japan invaded Manchuria in 1931 as Japan began a gradual shift from a free enterprise to a state controlled enterprise. 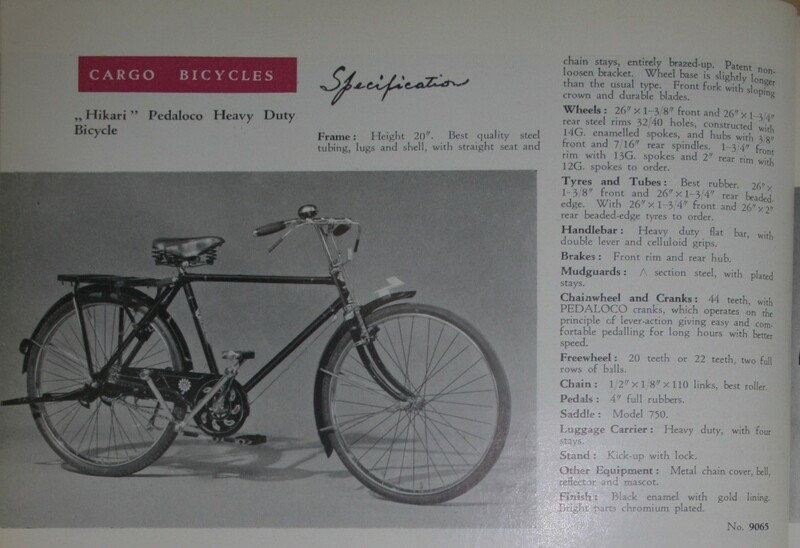 War and its impact on the bicycle industry are reflected in bicycles and catologs of this period 1931-1945. 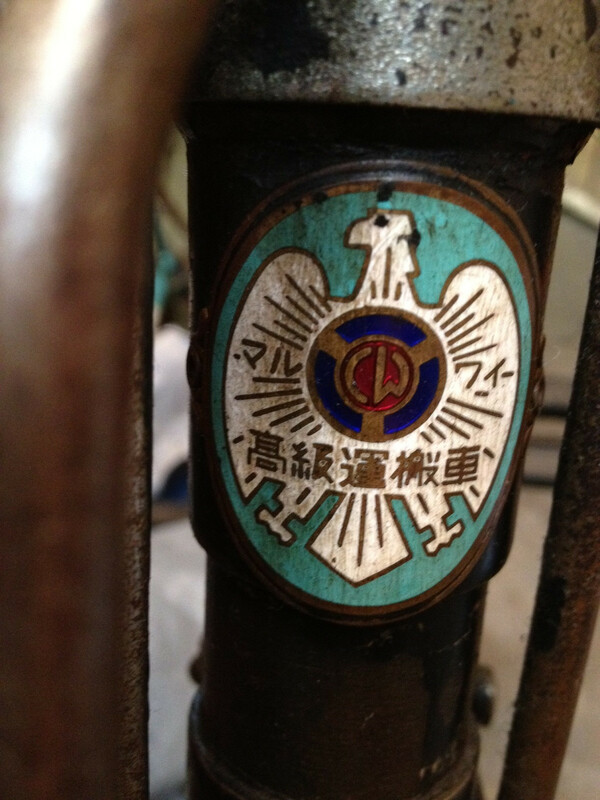 The head badge below shows two flags, Japan on the left and Manchuria on the right. 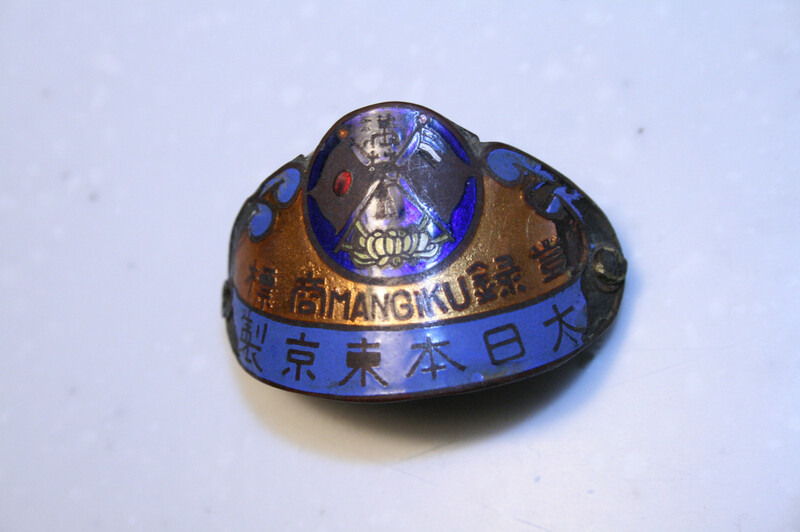 Probably dating back to around 1931 when Japan siezed Machchuria and then created the puppet state Manchuko. 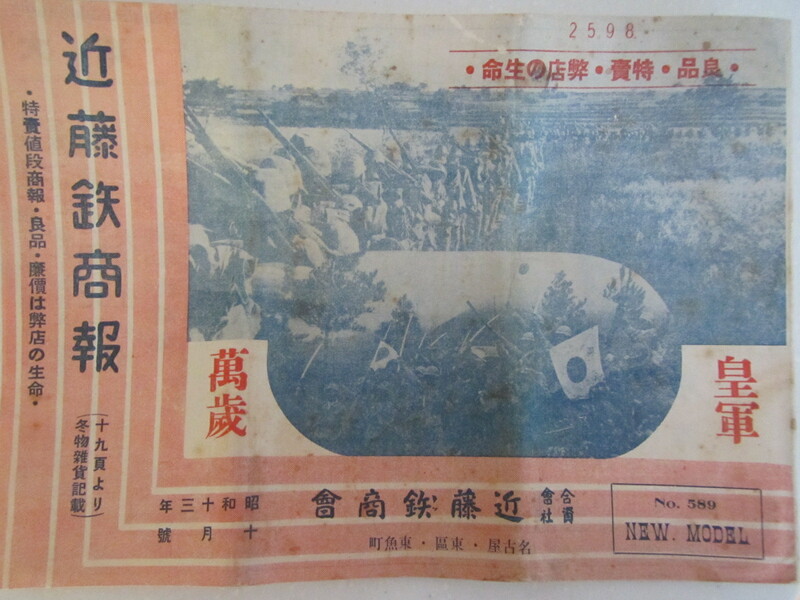 The bicycle catalog below from 1938 shows the Japanese Imperial Army, most likely in China as this period coincides with the Second Sino-Japanese War. 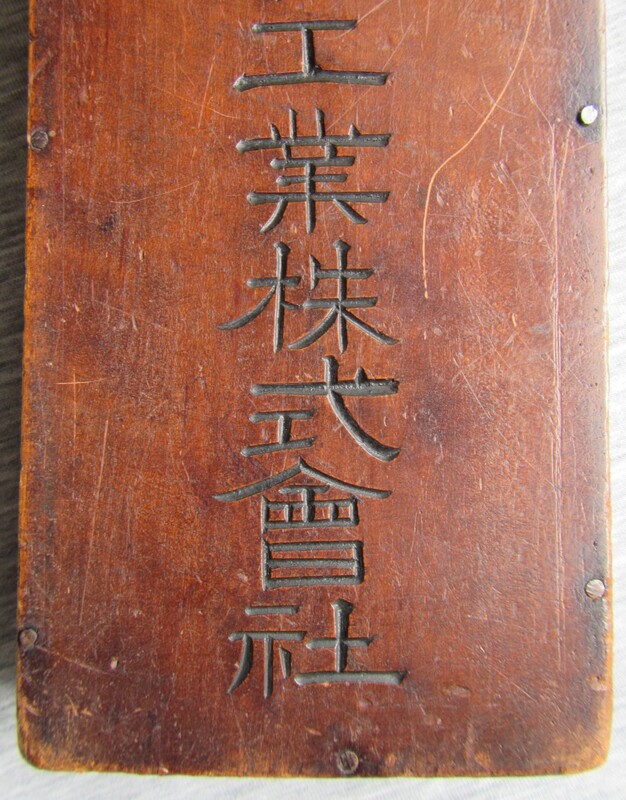 It states on the cover "Hurray for the Japanese Imperial Army". materials and goods became increasingly prescious choking consumer goods. The cover also emphasizes that with a war on and bicycle plants increasingly being coverted to munition plants to support the war-effort, materials will grow scarcer so now is the time to buy. 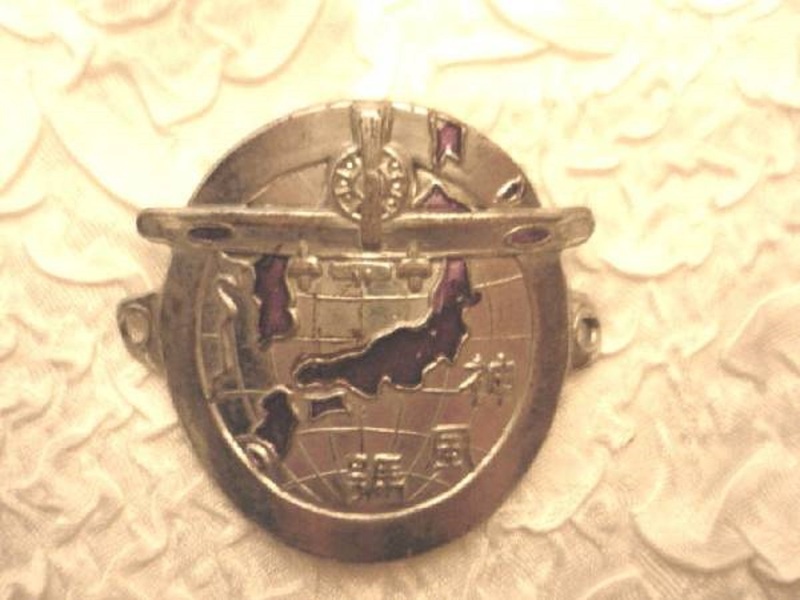 Here is a rare head badge from a model known as the Kamikaze, note the map and territories occuppied in red. As the war continued so did the decline in bicycle manufacturing as bicycle plants continued to be converted to munition plants to support the war effort. Lack of resources escalated the situation, many a bicycle was donated to scrap drives to be melted down and used for munitions. It is estimated that there were 10 million bicycles in Japan at the start of the war, by the end of the war that number was halved. 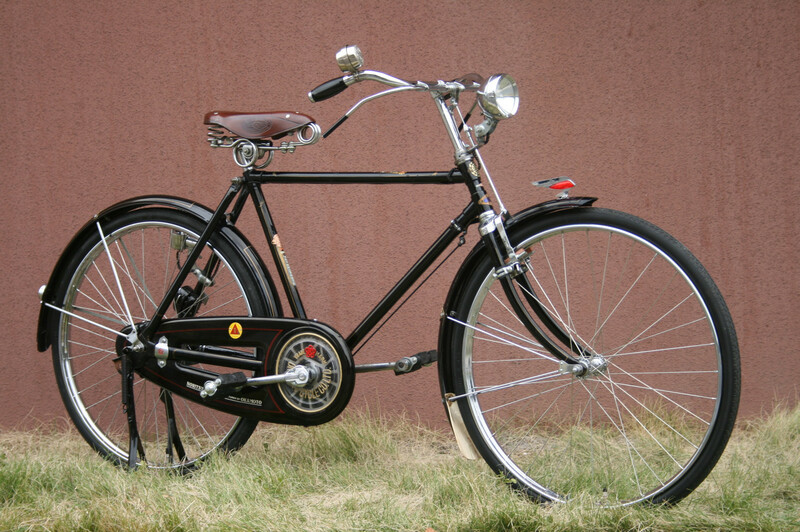 Pedaloco is the name of a bicycle produced in the early 1950's by a Japanese manufacturer known as Hikari. The name is derived from the combination of "pedal" and the abbreviated form of train, ie "loco" thus rendering "Pedaloco". Take close look at the the pedals. Yes, lever-action similar to what would be found on a train. 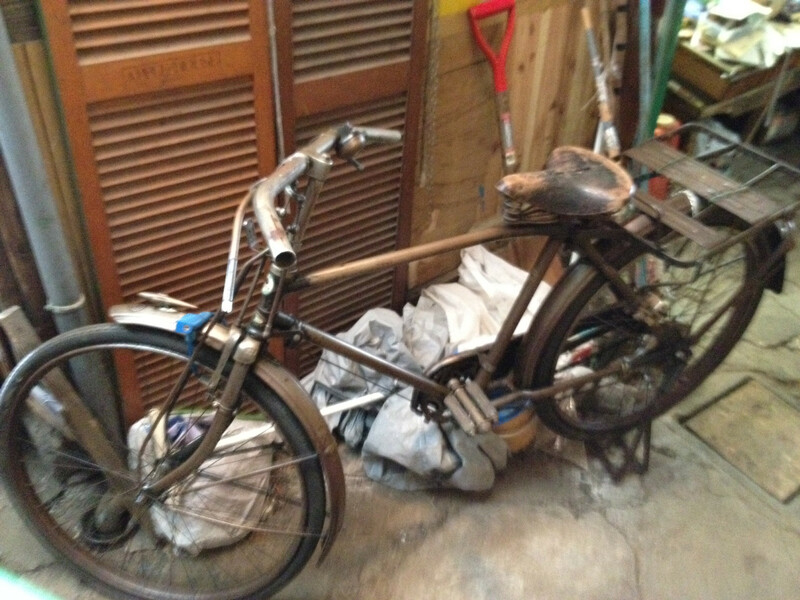 I received a request from Y-san who is looking for information on this very rare bicycle. 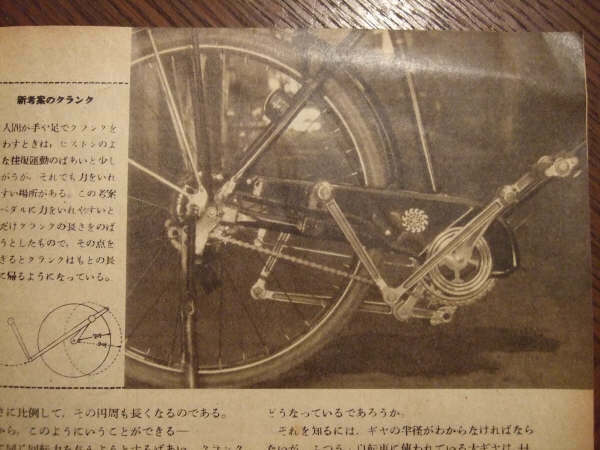 I remember years ago having posted this photo along with other Japanese vintage bicycles (Japanese only) from a 1953 export catalog shown below. Years ago a fellow enthusiast, now living in Germany and working at a museum as a "restorer" sent me the following information. The below magazine is entitled "Science Club" from the early 1950s. 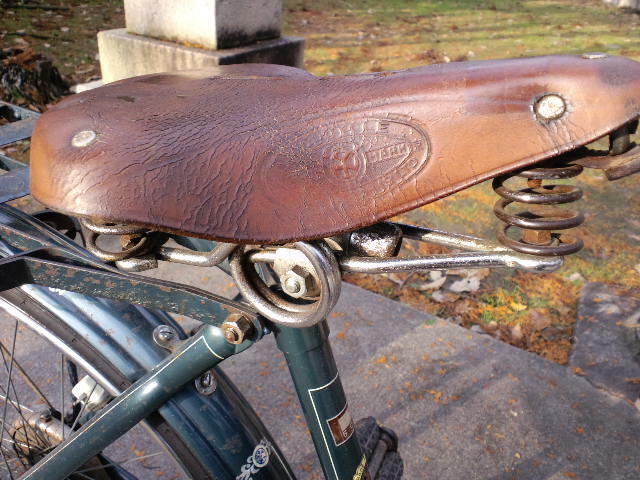 It provides a close-up of the lever-action pedals. A brief article on Pedaloco. A close-up of the unique lever-action pedals. It would be interesting to ride one of these and experience firsthand the difference, if any, that this unique lever-action design renders. It always amazes me that here in modern day Japan, one can still come across a bicycle sitting outside an old Mom & Pop family run shop that is over half a century old. This carrier bicycle obviously bears the battle scars of many years of faithful service and appears to have been recently retired. 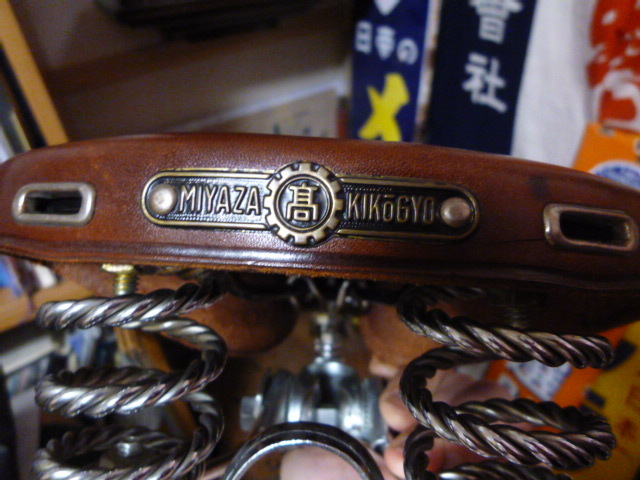 Vintage Japanese bicycle fans will quickly recognize the "Y" in the lamp bracket as the trade mark of the Yamaguchi Bicycle Company. The fender ornament is broken and the paint replaced with a fine patina. 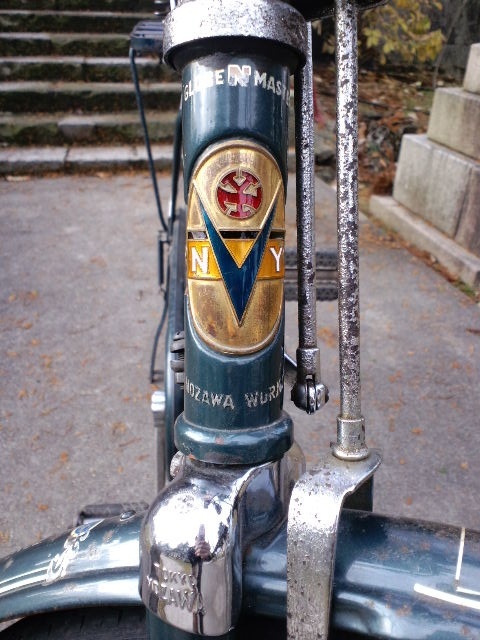 The Yamaguchi Bicycle Co., produced a brand know as "CW", the trade mark is stamped on the front fender. 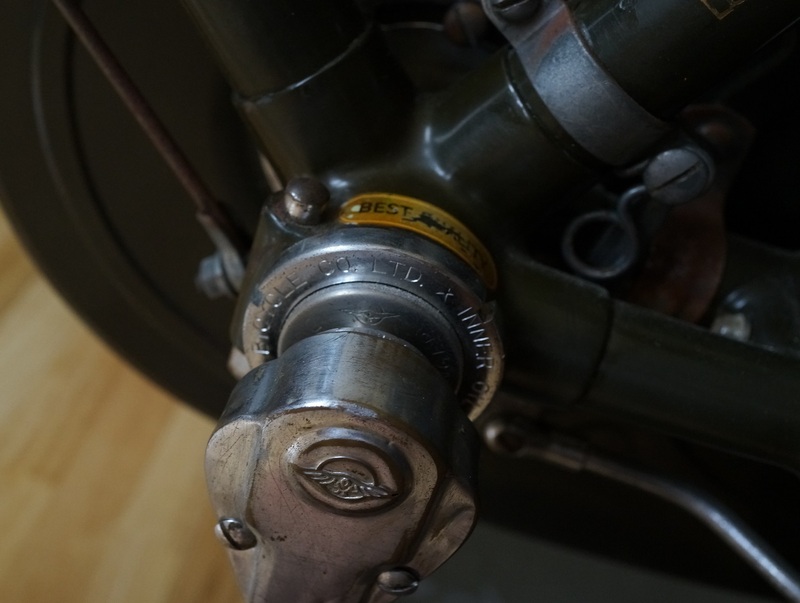 The trade mark was casted into the bolts used on the front fork stabilizers. 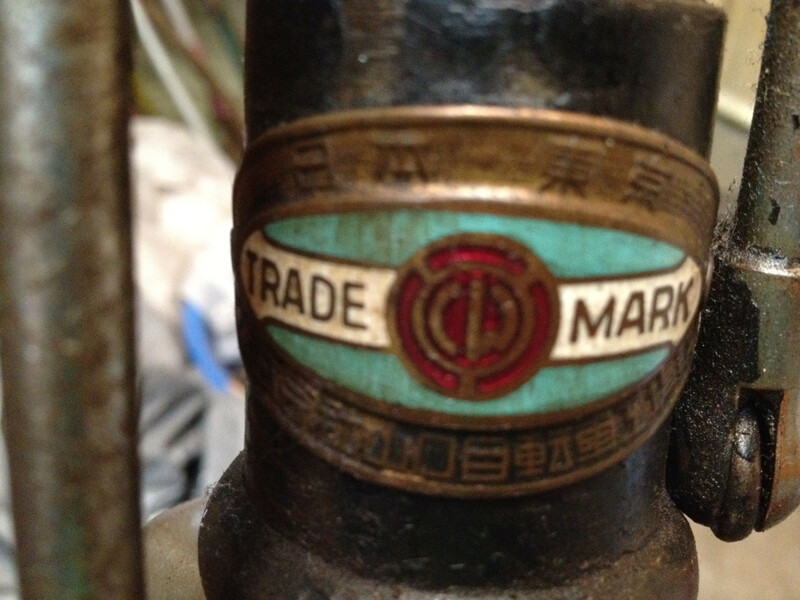 Amazing, produced over a half century ago, the cloisonne head badge is still in fine condition. Even the rear fender stay badge is in excellent shape. The workmanship that went into building these wonderful machines is amazing. Simple and sturdy manufactured back when durability and dependability were more important than eye-appeal. Truly built-to-last. If you are going to put your name on it, it better be good. 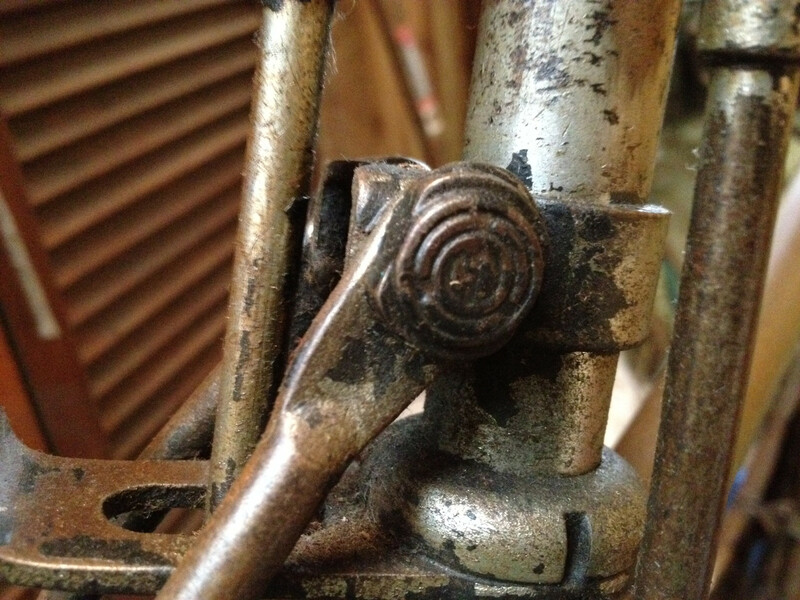 I have mentioned numerous times that nearly each part of vintage Japanese bicycles from the 1950's bore the manufacturer's name or company logo, right down to the tiny fender stay screws. It is not rare for a single part to have the company logo or name more than once. 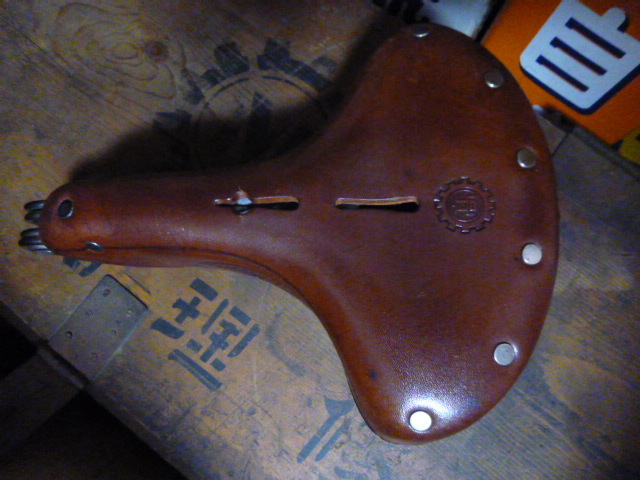 Take a good quality leather saddle for example. A high-end leather saddle will have the manufacturer's logo/name four times: once on each side, once on the rear and once on the top. Let's take a look. 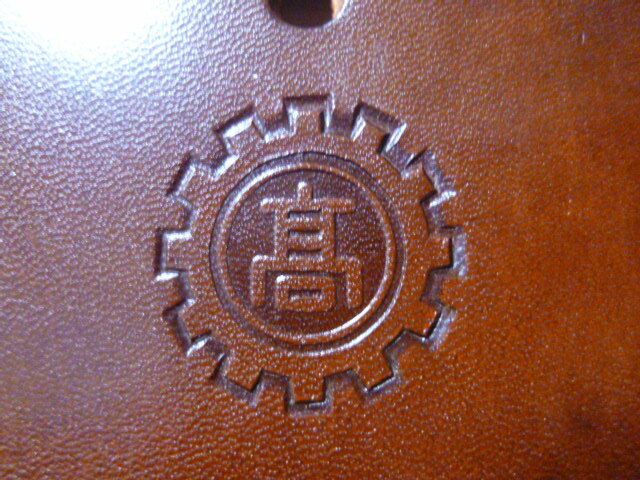 First two logos can be found stamped into the leather on the left and right sides. The third logo along with the company name can be found on the badge attached to the rear of the saddle. 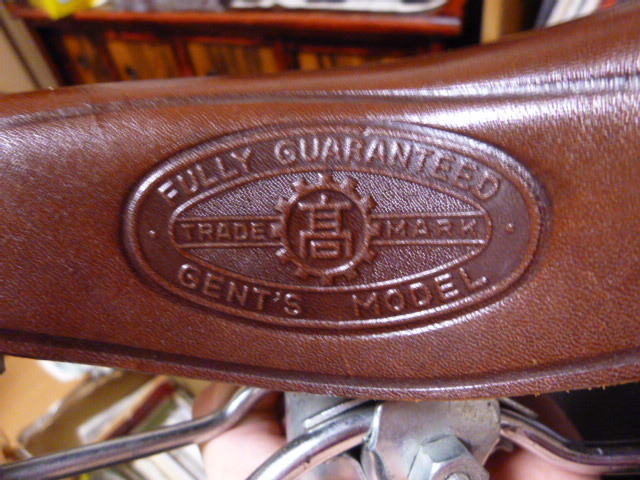 (Note there is no JIS mark on the badge denoting that this saddle was manufactured before 1958. 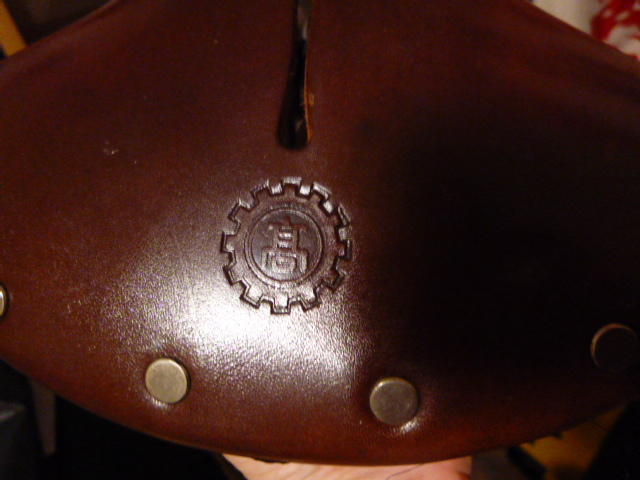 The fourth logo marking is found stamped on the top of the saddle. Heavy? Yes. But you don't need to wear special padded pants when you ride a bicycle with one of these saddles, because comfort is built-in. High quality, superior comfort, beautiful and built to last a lifetime...you better believe it. And that is exactly why I am totally sold on bicycles from the 1950's, because they were crafted to surpass the end-users' expectations. Yep, they surely do not make them like they used to (Part 2 video). 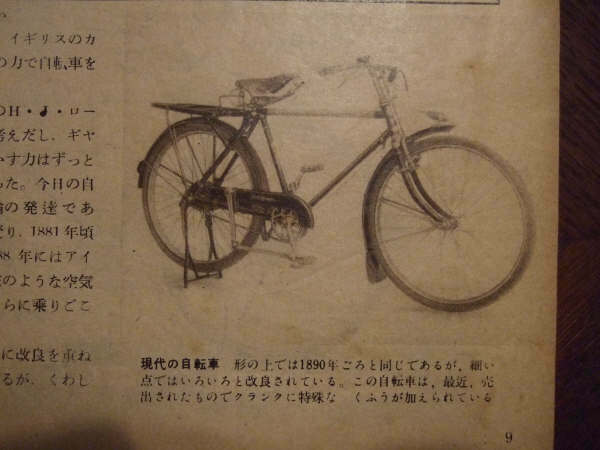 I have mentioned repeatedly how "bicycles" in Japan during the early 1950's were prized possessions; similar, if not even exceeding, that of automobile ownership today. They were the only affordable private transportation for the vast majority of households and small businesses. They were expensive costing around two months' salary or more; people and businesses paid on installment plans to purchase them; those who could not afford them rented them by the hour; carrier cycles and utility cycles attached with trailers to haul goods filled the niche of trucks for local small businesses; much like luxury cars of today, bicycles proudly bore a fender ornament(link Japanese only) indicating the manufacturer. 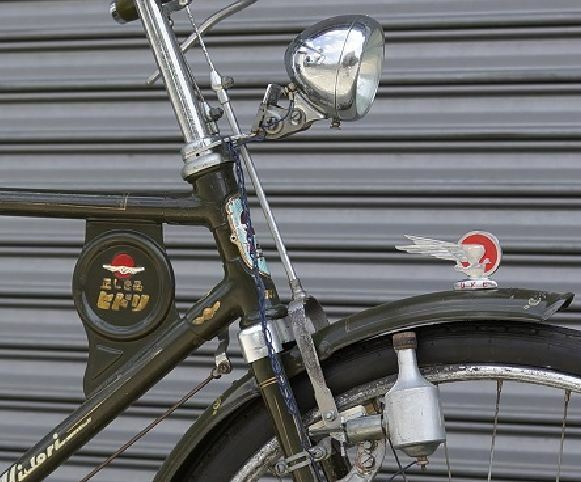 And, to drive this point of bicycles having a similar status as that of automobiles, one often overlooked fact is that from 1950-1958 bicycles in Japan were taxed and had license plates. 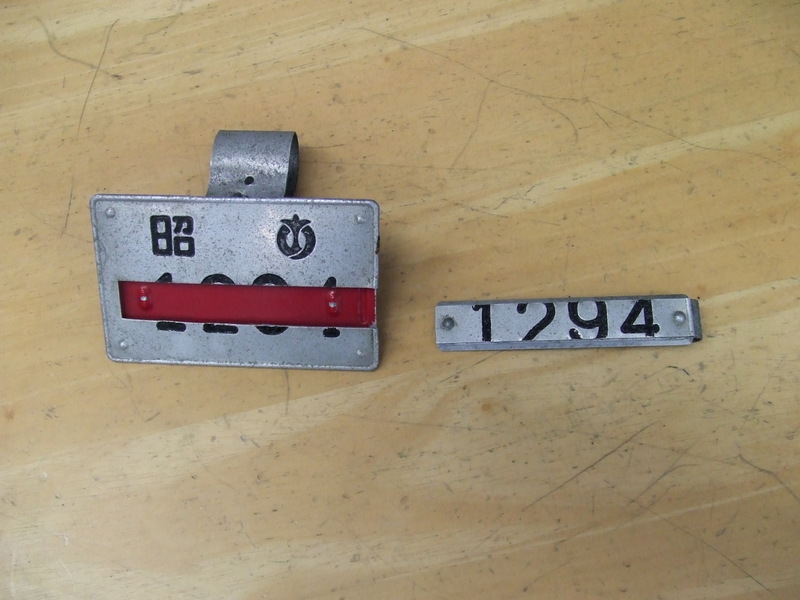 This tax was implemented by the local municipality (town/city) whereby each bicycle had to be registered, and after paying the tax of 200 yen, a "license plate"was attached. Since the local municipality oversaw the implementation of the "bicycle tax", the design of these "license plates" varied from town to town. One of the more popular form of license plate design were those attached to the back of the rear fender. The license plate had the name of the municipality and number. 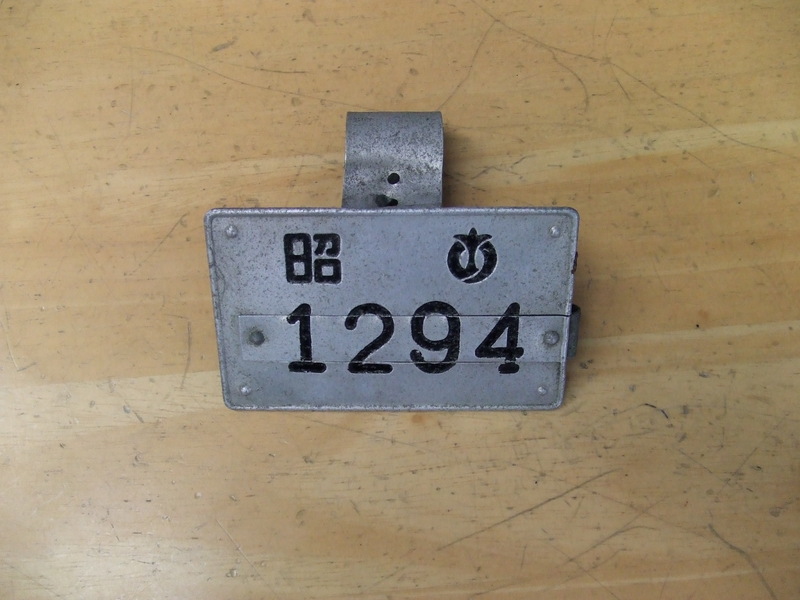 Much like a license plate on today's automobile which typically bears the state or prefecture. One unique and interesting concept was a form of the license plate attached to the handlebars. The interesting point is that the design incorporated an anti-theft device. Notice the license plate below bears the numbers 1294. Also, if you look closely, there appears to be a strip running across the middle of the numbers. This strip is actually a removable sliding plate. Remember that bicycles were prized possessions, cost two months' salary and were not that difficult to steal. When the sliding plate is removed it leaves a red blank shown in the photo below. The intention was that when the owner arrived at the desired destination, after locking the bicycle, the owner removed the sliding plate and took it with them. 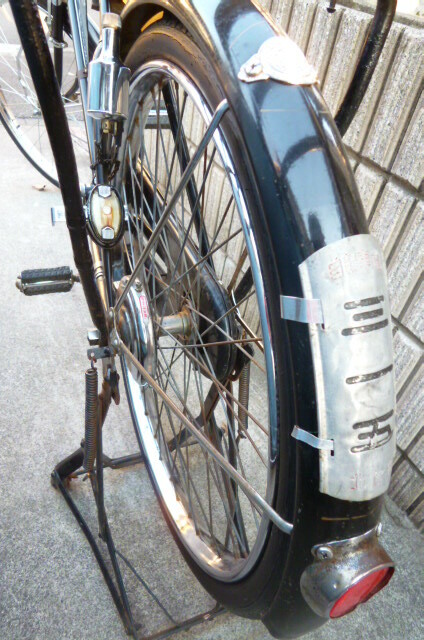 When they returned to the bicycle they inserted the sliding plate. If, while they were away, someone were to steal the bicycle the red blank was a dead give away that the bicycle was stolen. Like many things in life, it probably seemed like a good idea at the time, but was unpractical as the owner could lose the sliding plate and be mistaken for having stolen his own bicycle! 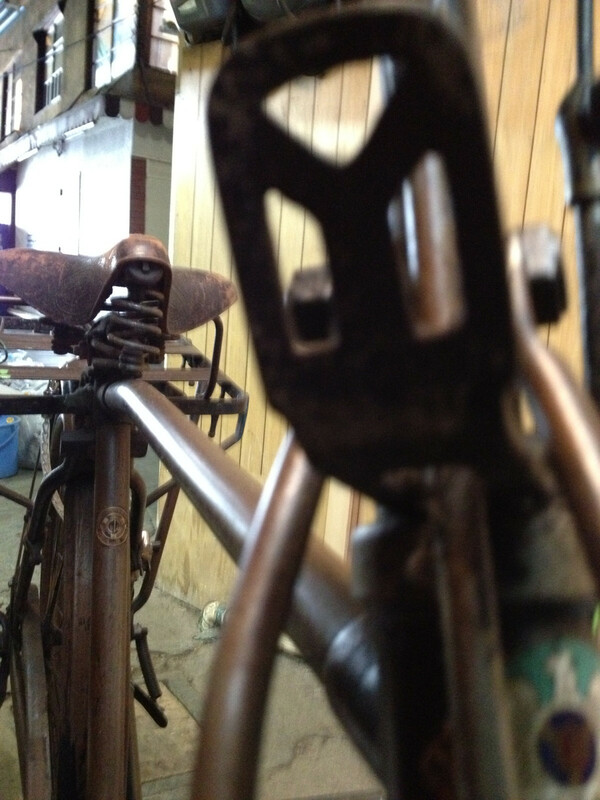 In the previous post we took a brief look at Nozawa Bicycle Works. 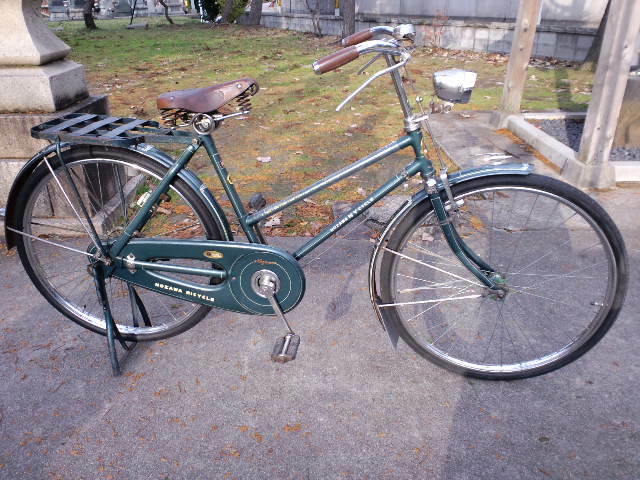 "S"-san a vintage bicycle enthusiast from Niigata prefecture recently sent in these photos of his vintage Nozawa bicycle. Certainly is one clean machine. Let's take a closer look. full fenders, mud flap, pinstriping etc. Note the fender ornament, Nozawa stamp, hand painted dual line pinstriping and ornate transfer. 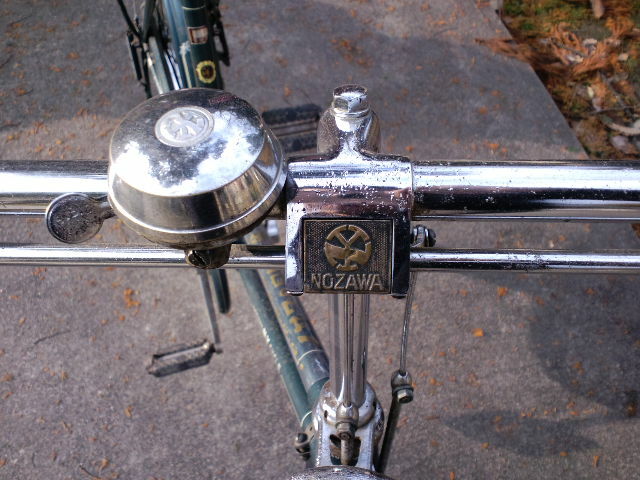 Classic rod brake handlebars that have the high-end brass spring protector complete with raised letter Nozawa logo. Also note the chrome plated brass bell with Nozawa logo. 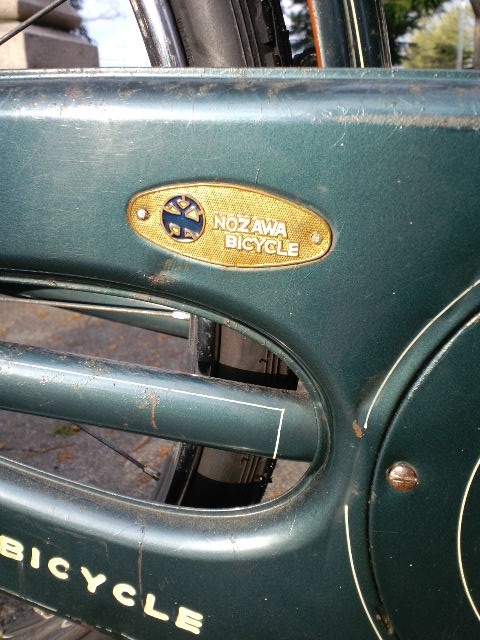 Though hard to see, the top tube sports a Nozawa frame cover, the pedals have the Nozawa logo on the rubber blocks, and the seat tube has at least one badge. 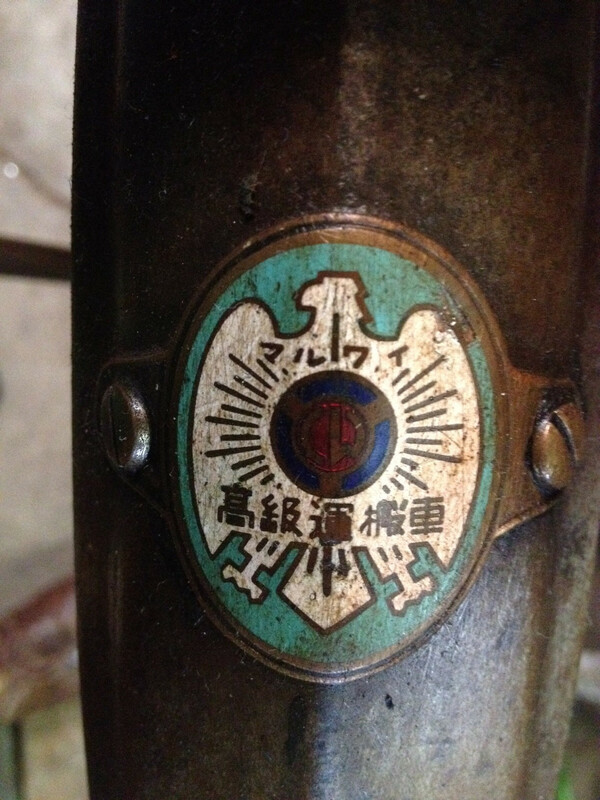 Head badge appears to be partially cloisonne, crown is chrome with "Tokyo Nozawa" raised letter stamping.. 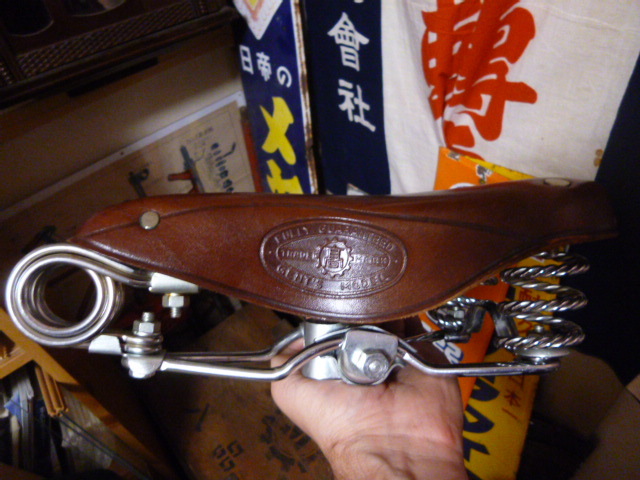 Sprung leather saddle with Nozawa Works stamp. 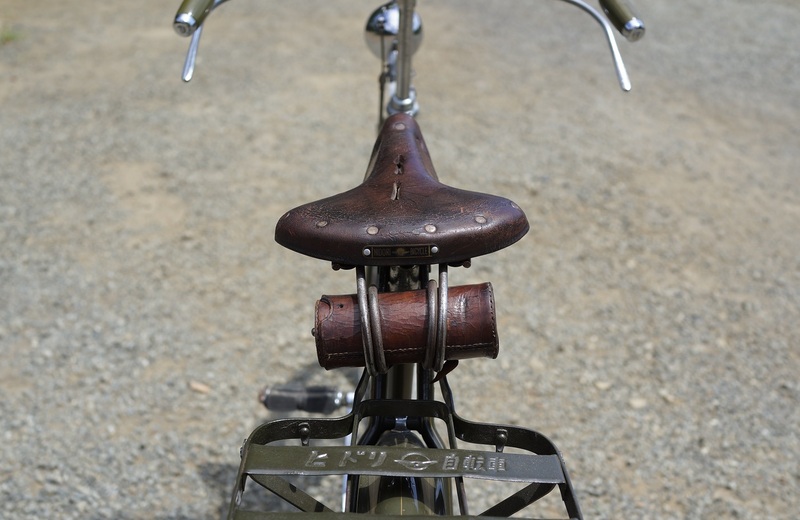 Note the unique design of the large rings on saddle frame. 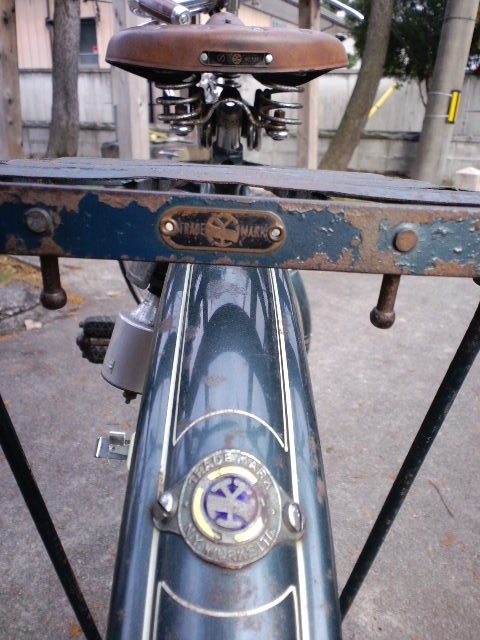 Saddle badge, rear carrier badge and cloisonne fender stay badge. Note the screws are slotted (minus) screws. It has been my experience that the quality of materials used for screws varied greatly among the manufacturers. Again note the hand painted pinstriping. Chaincase badge. 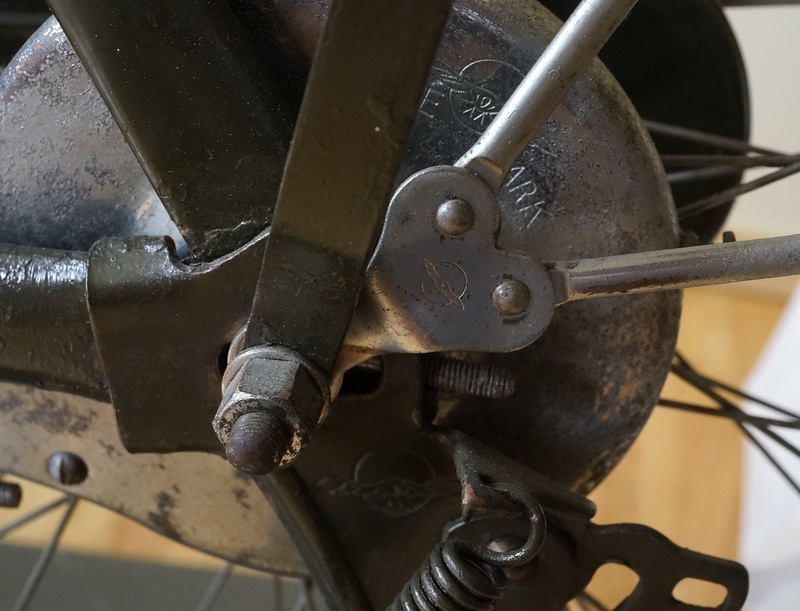 Note the slotted screw for the crankwheel cover. 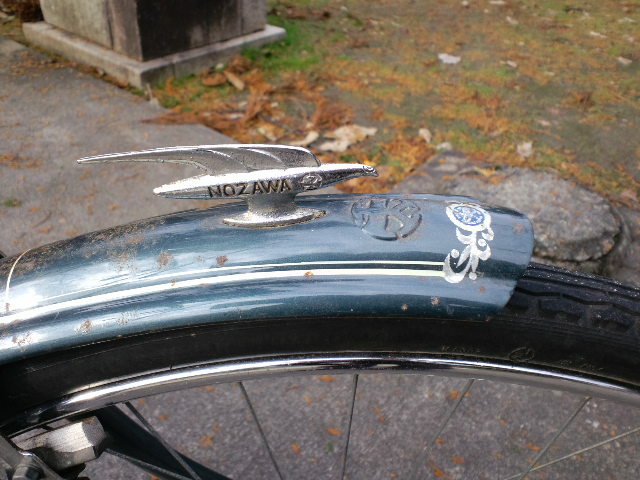 Materials used for screws varied greatly among the manufacturers, but the screws on the Nozawa bicycles are exceptionally good. 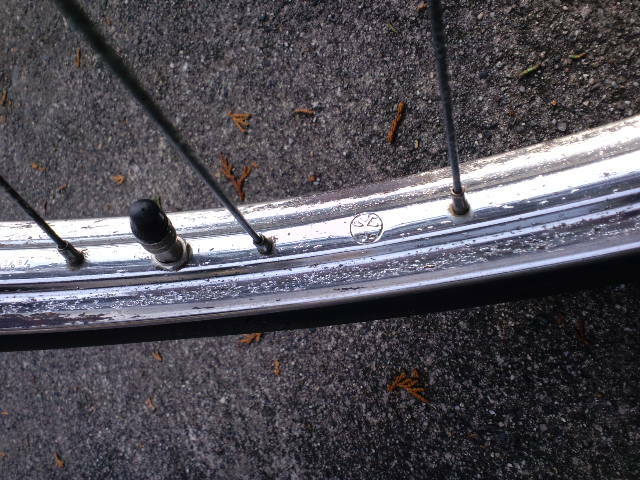 Chrome BE rims stamped with the Nozawa Works logo. They don't make them like they used to, that's for sure. Thanks goes out to "S-san" for sharing photos of his two wheeled buddy.